The following instruments are currently for sale. I accept paypal for non local sales, and cash for local sales. All prices do not include shipping. 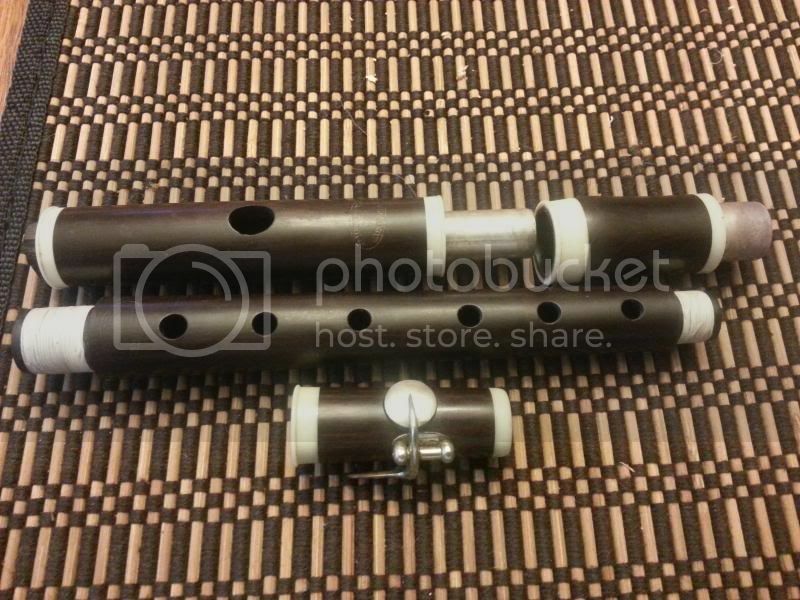 If you are interested in an instrument, please send me a message through my contact page and include your mailing address for a shipping quote. 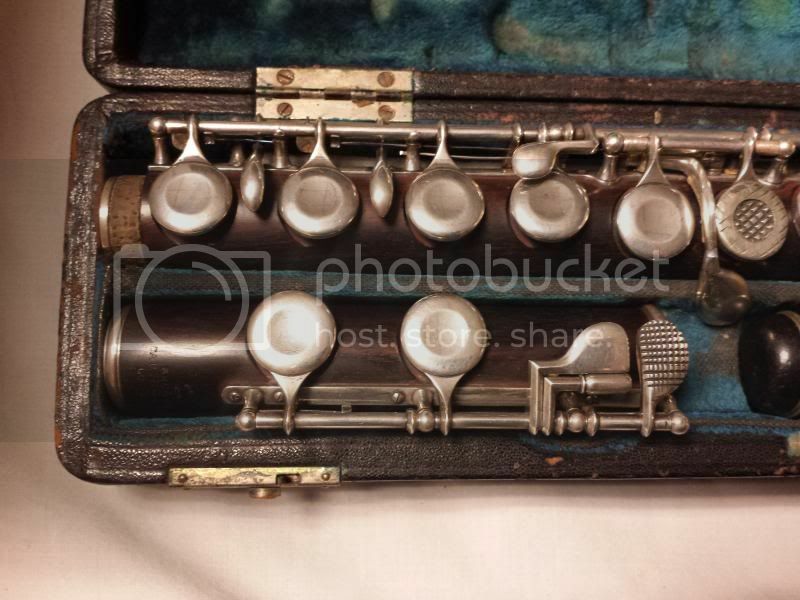 Rare early Godfroy 8 key flute. Stamped on each part with the sunburst face / Godfroy Aine / star, and on the lower 3 joints this stamp is followed with star / a paris / star. This is the stamp that was used from 1818 to 1828. 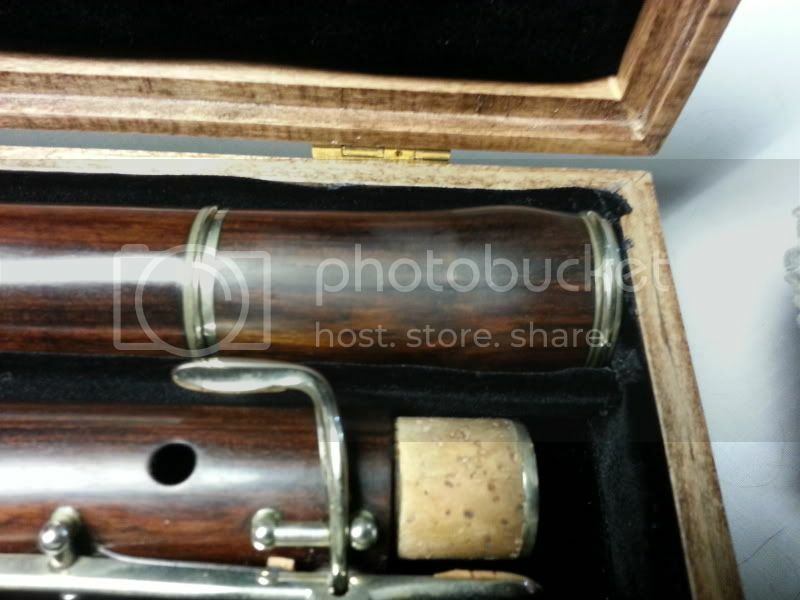 I date this flute to the early part of this time (1818) due to the lack of serial number. It was sometime during the early part of this stamp that Godfroy started using serial numbers according to Tula Giannini. The head cap has the standard engraved mother of pearl inlay. 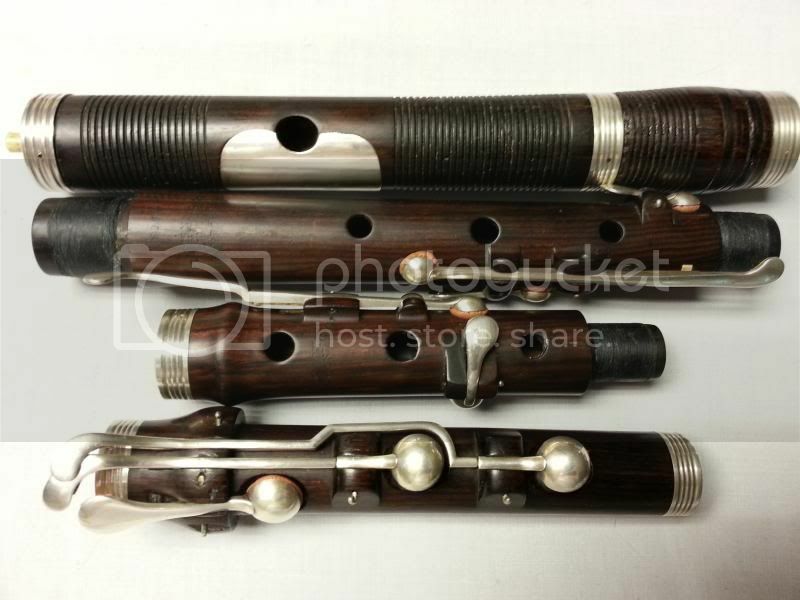 The flute is made of grenadilla with silver keys. Not stamped sterling, but definitely not nickel silver. 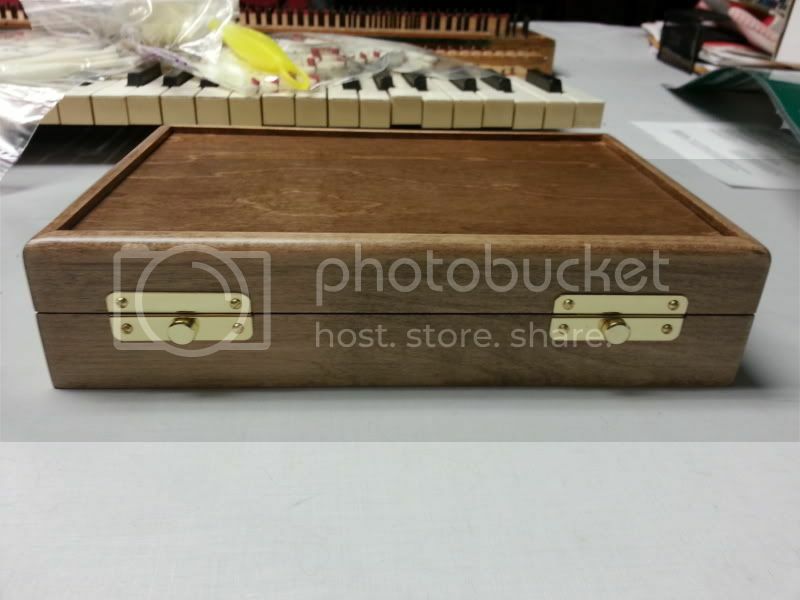 All keys are mounted to half moon shaped plates that are screwed to the body. 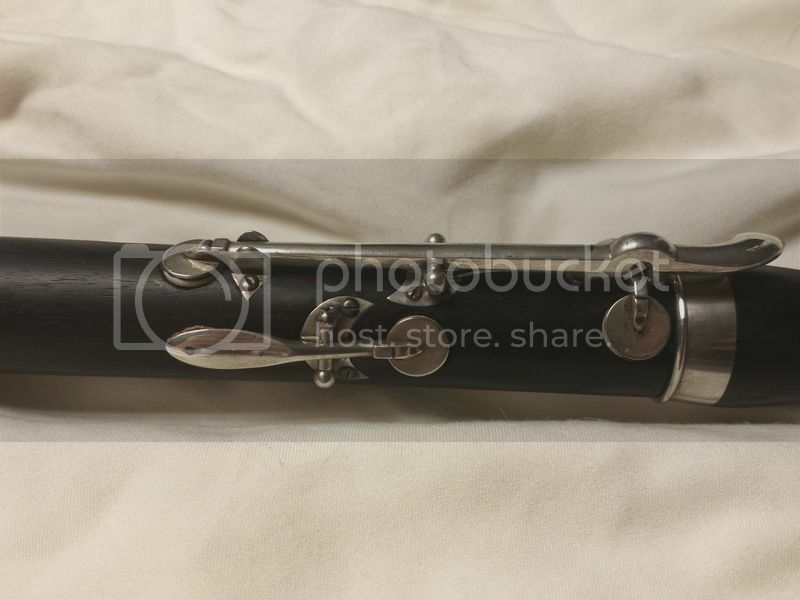 The rarest thing about this flute is the foot joint design. 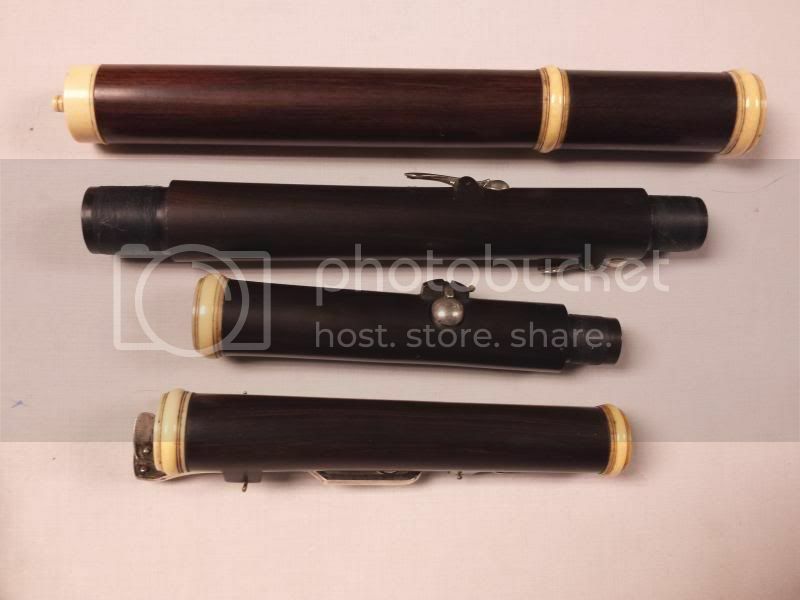 I have talked to many other flute history enthusiasts, and this appears to be the only known flute with this design flute from this maker. On top of that, c-foot flutes of this year stamp are rare to begin with. 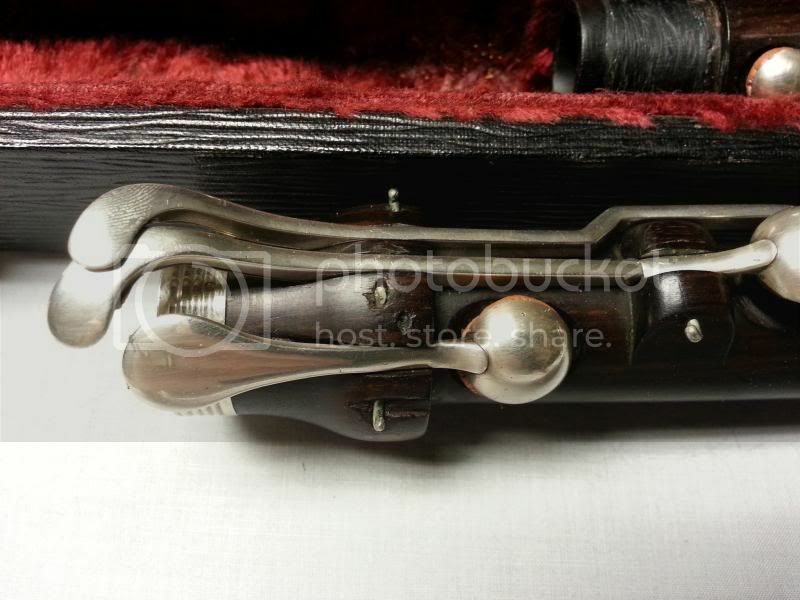 The foot is an elegant design, and the thick leather pads used are new replicas of what was on there originally. 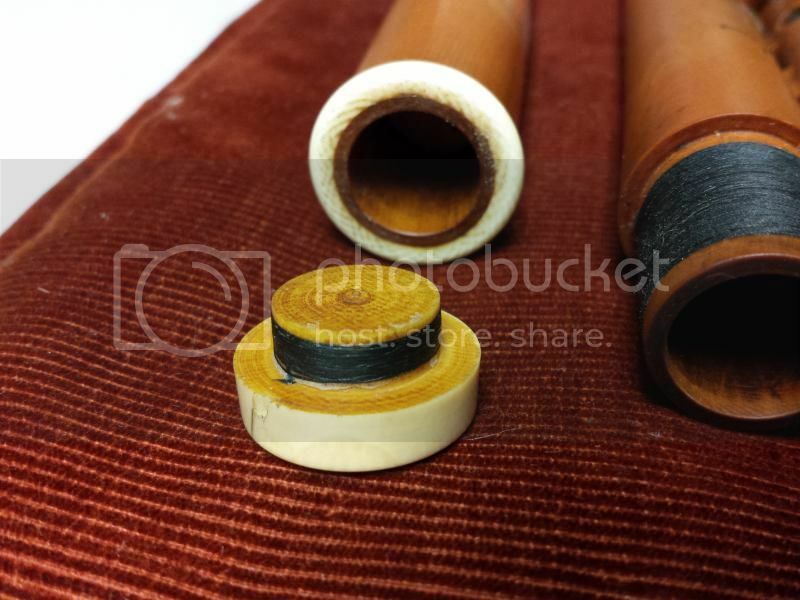 The rest of the flute is fitted with high quality felt pads, and tenons wrapped in natural cork. 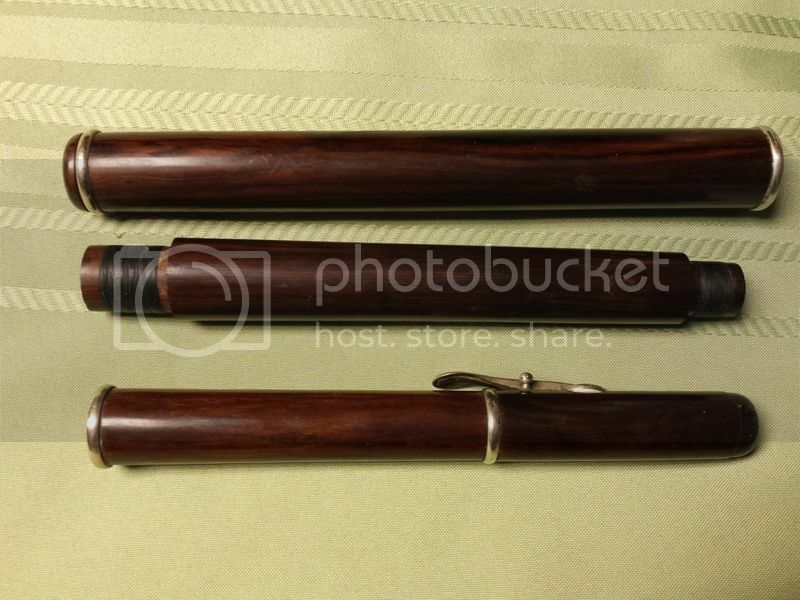 This flute is delicate and elegant to hold; it is not a thick walled or heavy flute. The sound is small and sweet, and it plays well in all octaves. 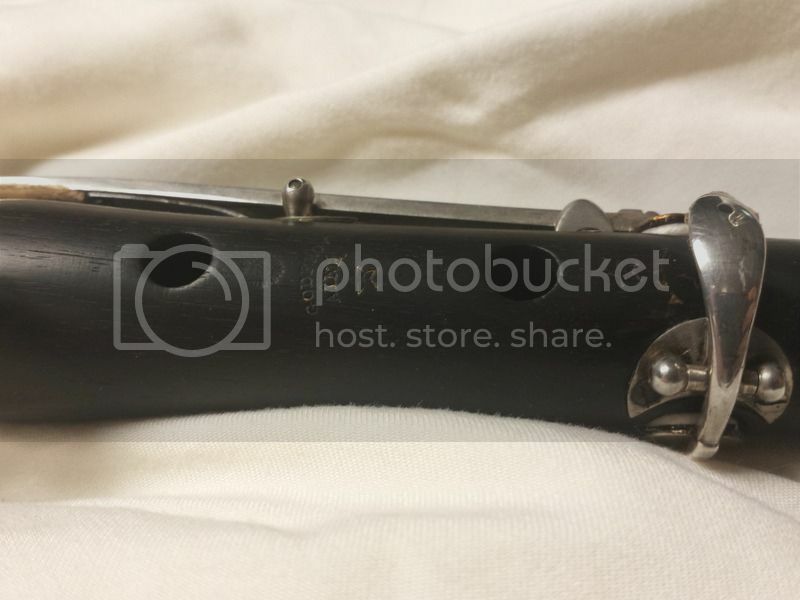 There is one small repaired crack to the barrel, a missing silver ring on the end of the foot, and a small screw missing on the plate for the long f key. No other repairs or cracks that I can see. 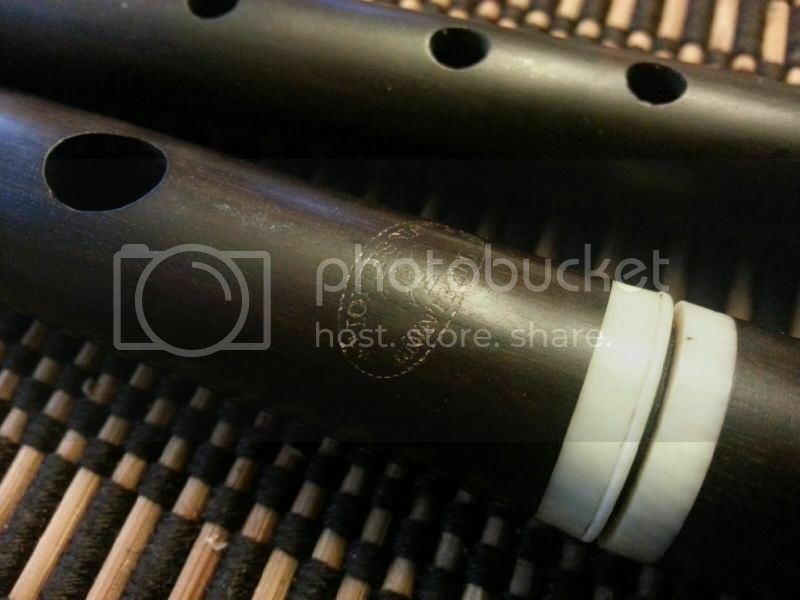 The bore of this flute is still nice and smooth, and embouchure hole still crisp. 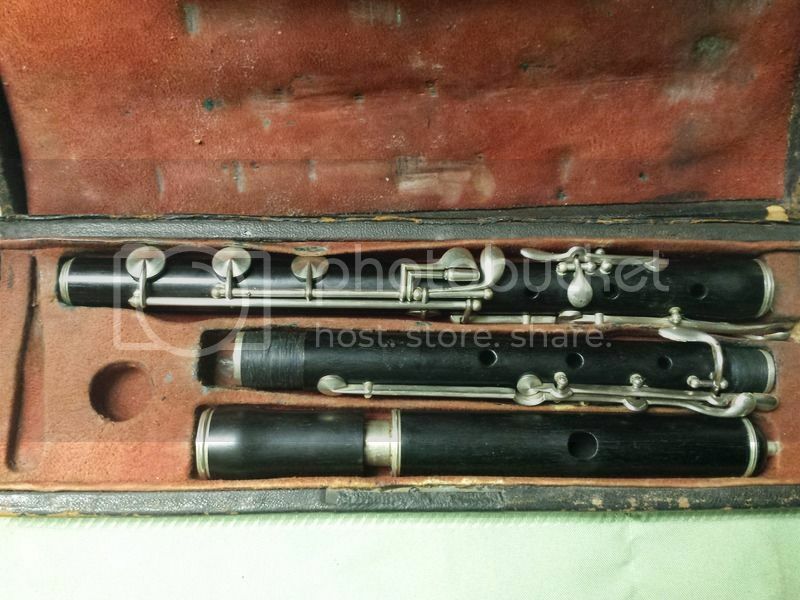 The flute comes without a case. 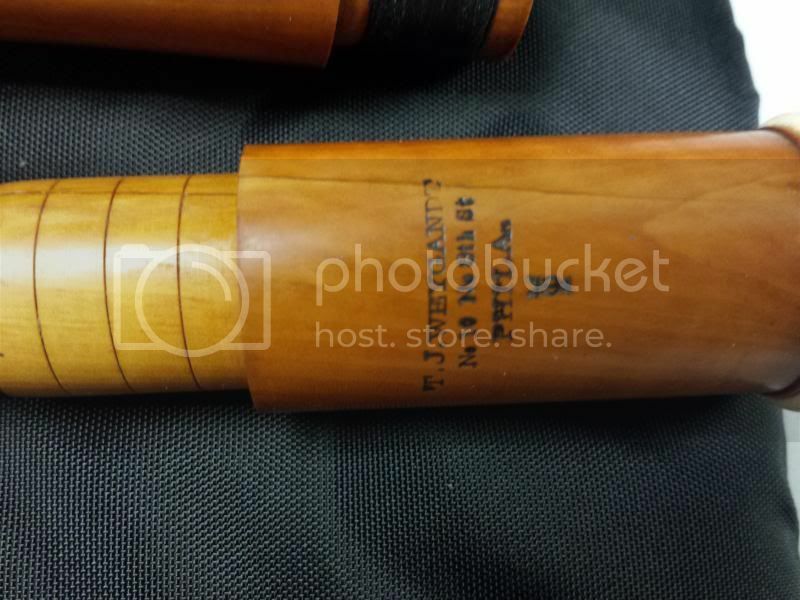 Goulding & D'Almaine Boxwood 8-key flute. 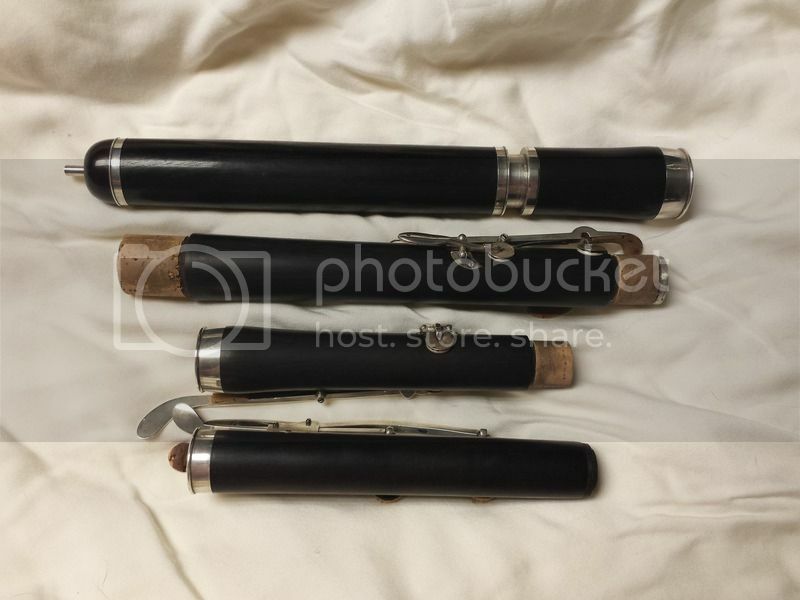 This is a great condition boxwood flute from the Goulding & D'Almaine Company. 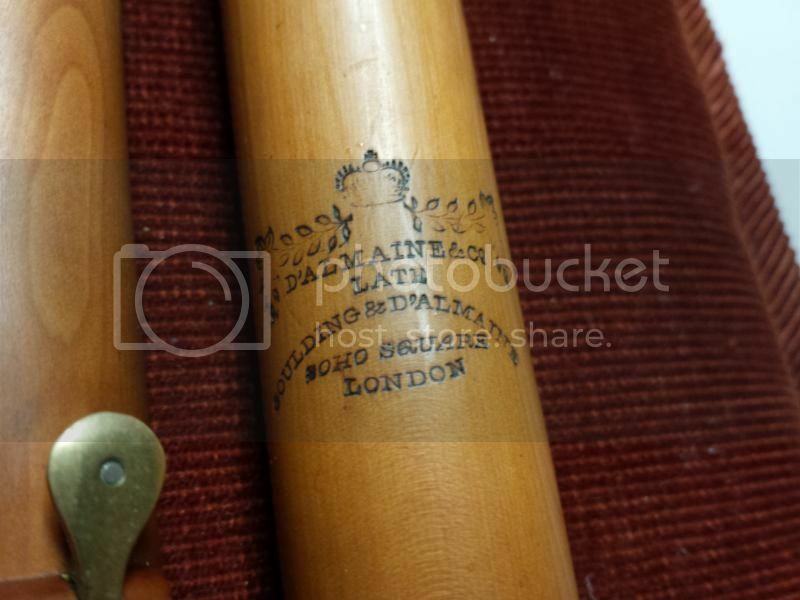 The stamp on the headjoint is dark and crisp, reading "D'Almaine & Co. / Late / Goulding & D'Almaine / Soho Square / London" which likely dates the flute to around 1836-1840 when D'Almaine took over the firm from Goulding. 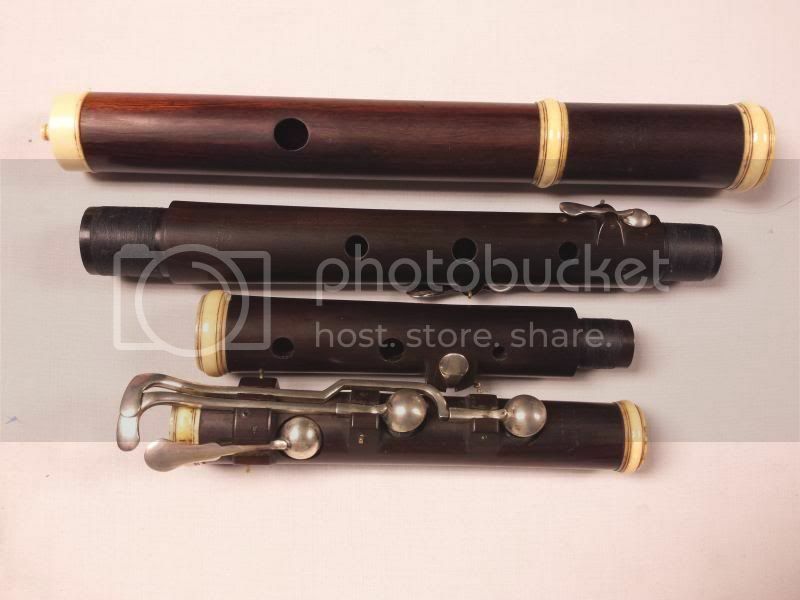 The flute has 8 solid brass flat back keys, *unlined* headjoint, and original head cap. 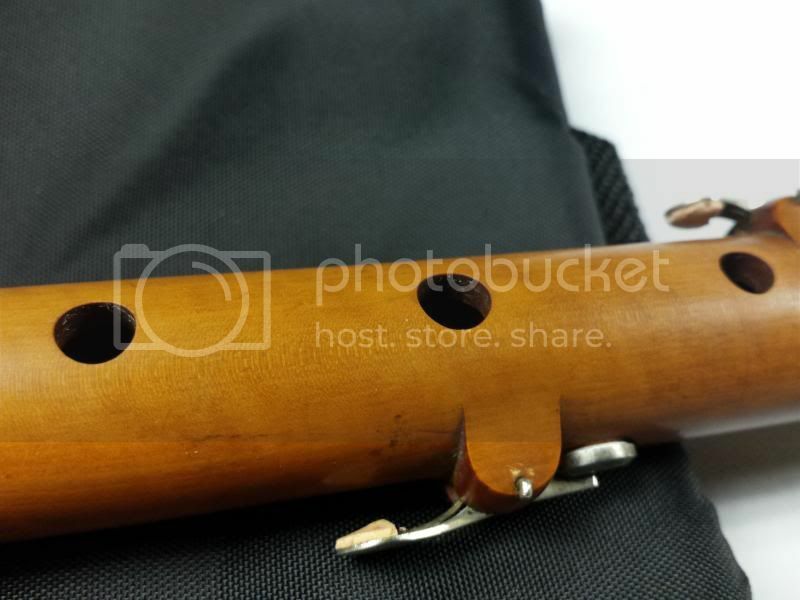 There are no cracks to this flute. There is a solder repair to the key head of the short f key, but the repair is solid, and the key pad seats well. 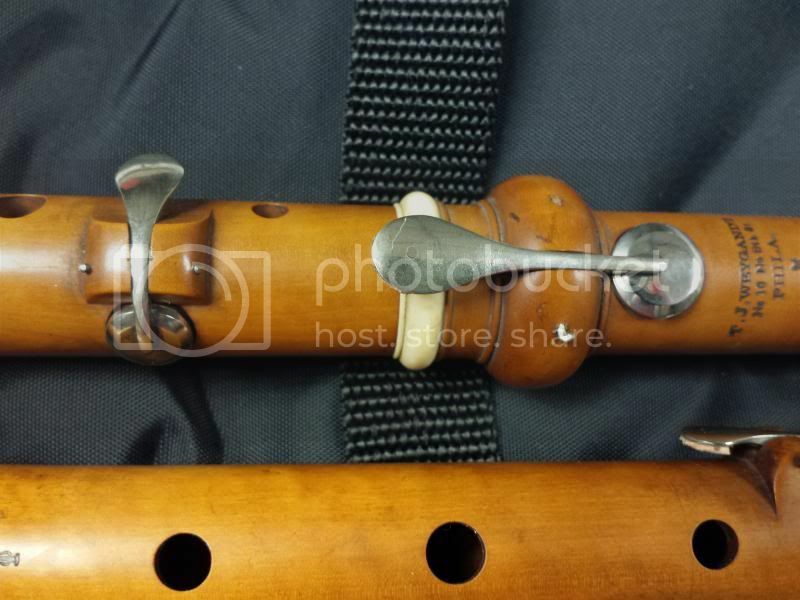 The flute has just been completely overhauled with new real leather pads, new tenon threads, and new head cork. It plays right at 440 with the head all the way in. 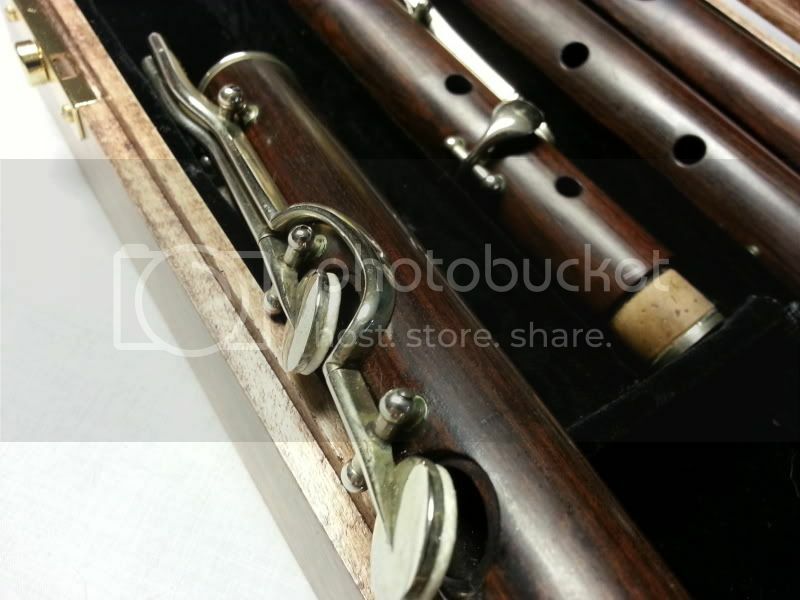 Tuning is good on this flute - as with any of these old flutes, you need to learn each flute's tendencies, but it is all completely manageable and workable. 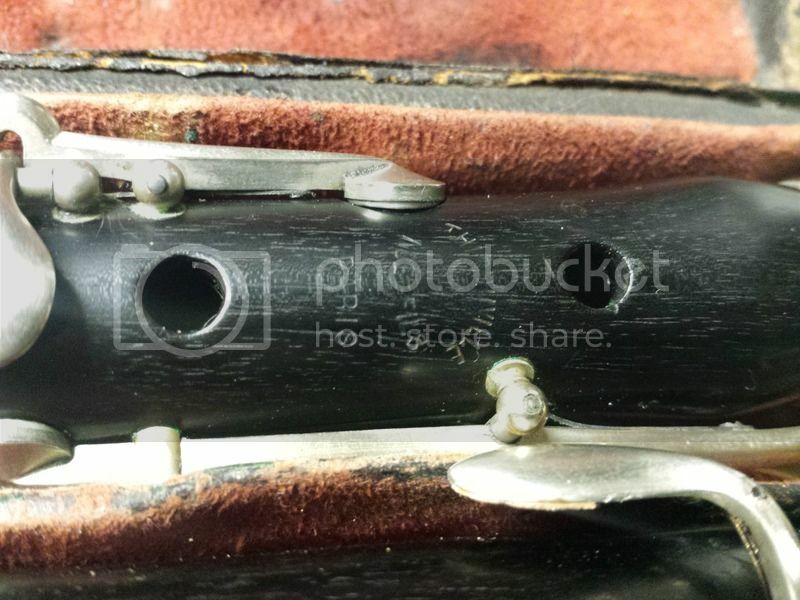 The embouchure hole is nice and crisp. There are a couple knife marks around key heads from a previous old restoration where they cut the pads after attaching it to the key - I have taken a few pictures of these. 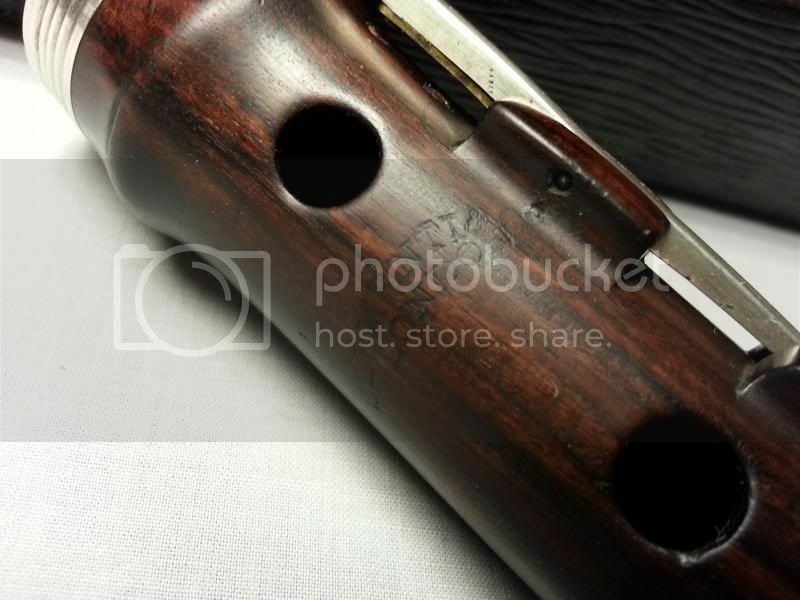 The marks are all superficial and do not have any effect on the playability of this flute. 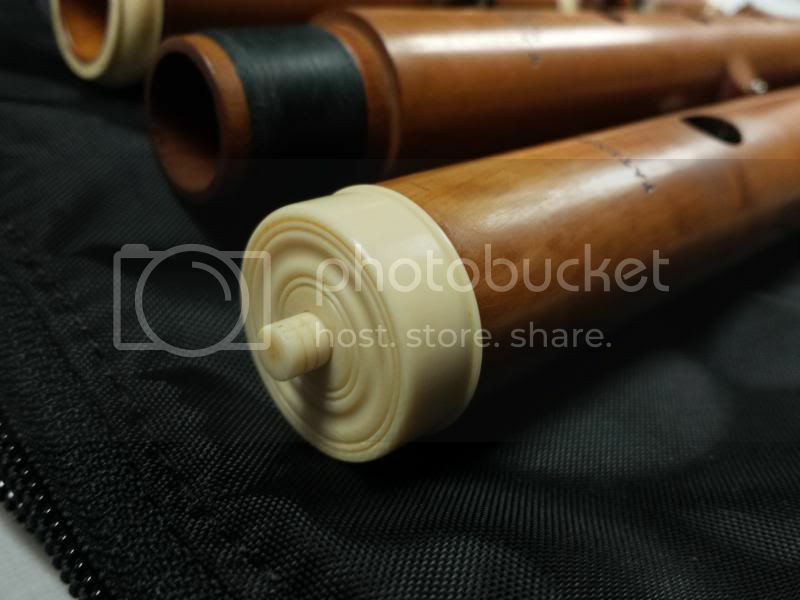 The flute plays with a strong voice, with a brightness you would expect of boxwood. 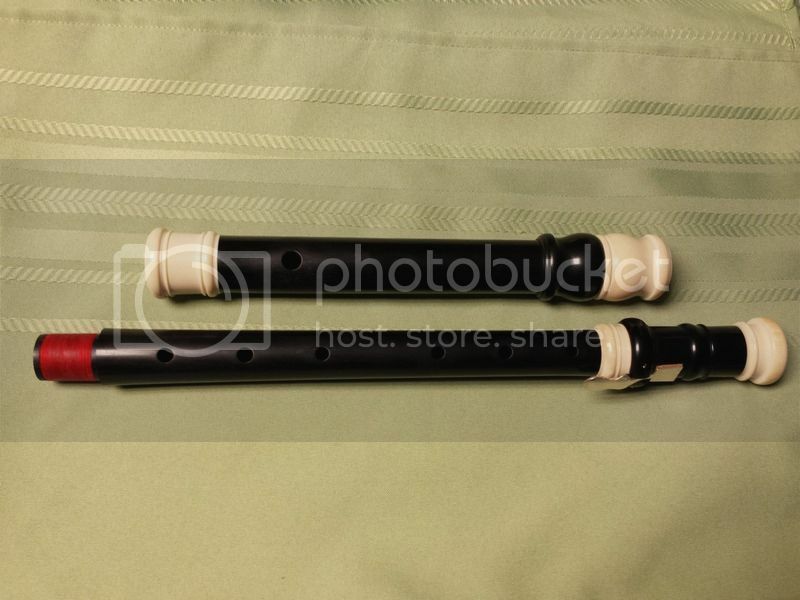 Depending on how you blow, this could be a great irish/trad flute, or a nice romantic flute. 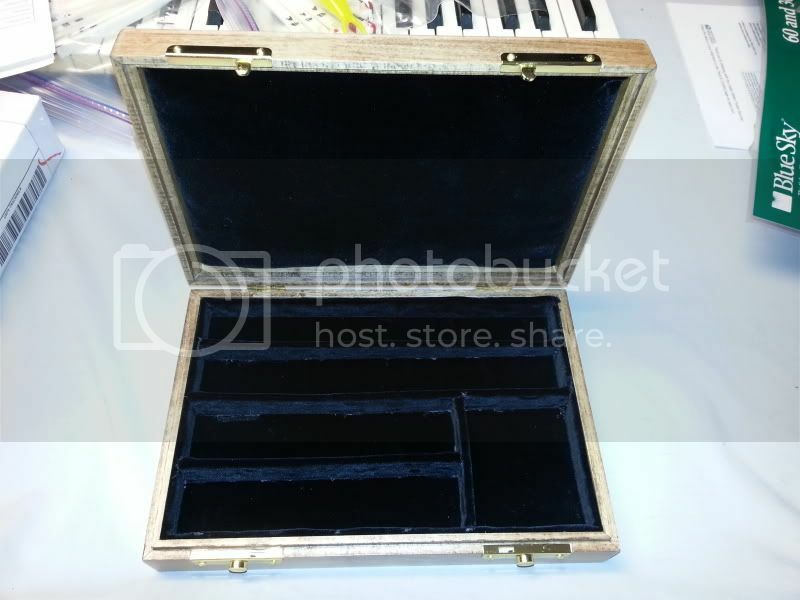 Comes with a slotted roll case. 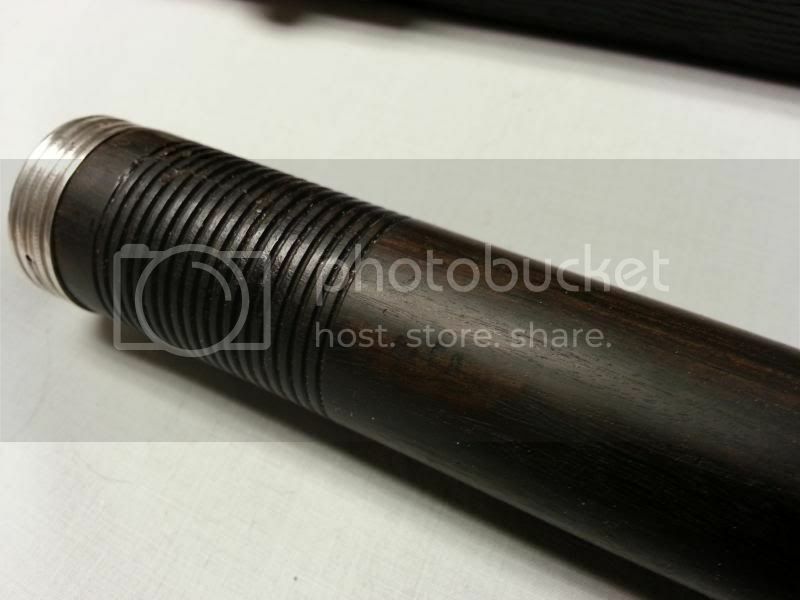 Flutes made like this and still in this great of shape are hard to come by. 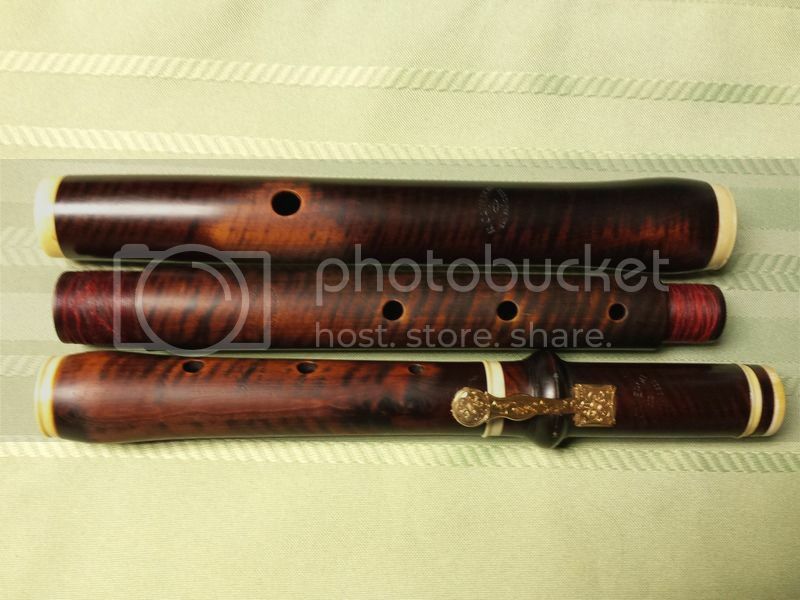 T.J. Weygandt of Philadelphia Boxwood 4-key wood flute. This is a very rare, and early example from the shop of Thomas J. Weygandt (1800-1874).The New Langwell Index lists him as a trained wood turner, successor to A. Hart of Bacon & Hart in 1833, and supplier for the Klemm Brothers in Philadelphia. 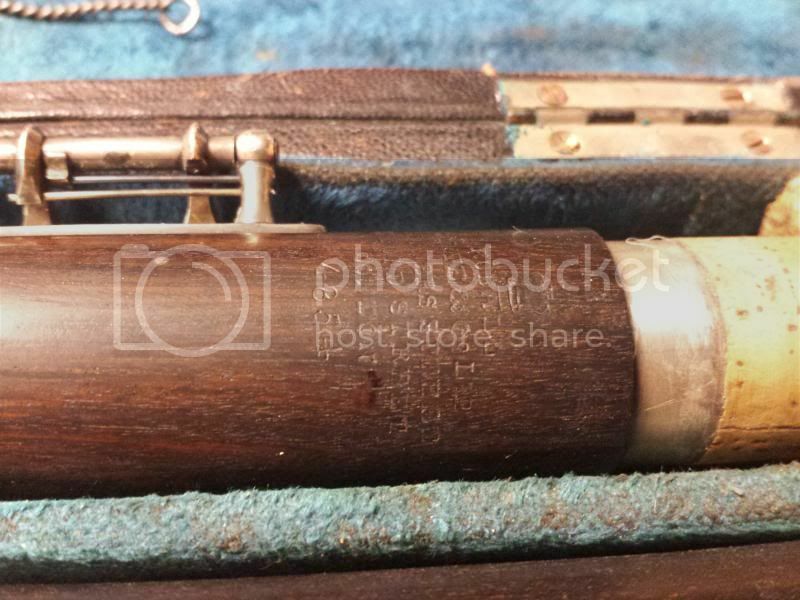 The stamp on this flute reads "T.J. Weygandt / No 10 No 8th St / PHILA. 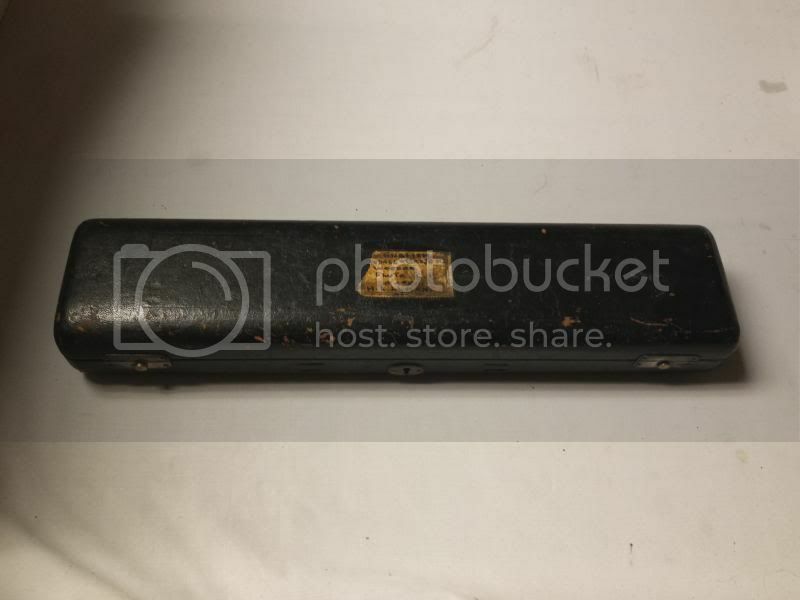 / (lyre)" which dates this flute to 1839 - 1853. 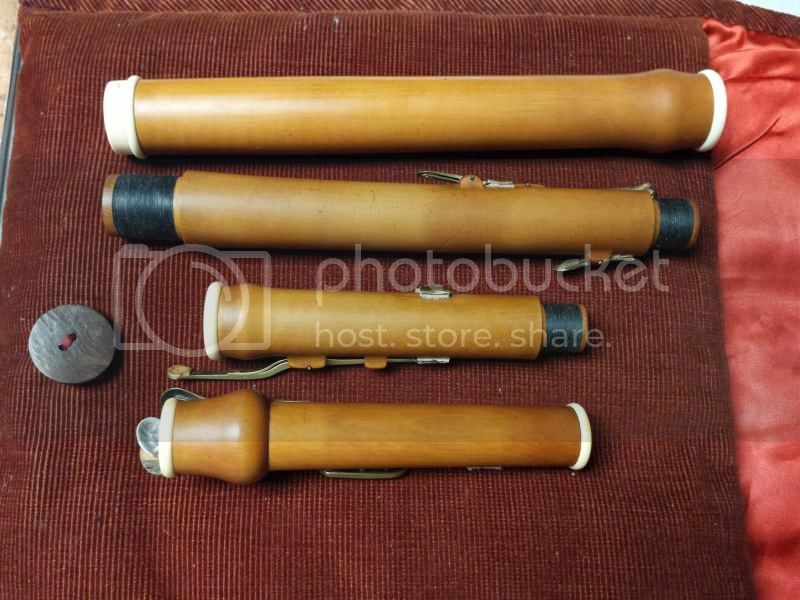 The flute quite literally looks like it was just made. 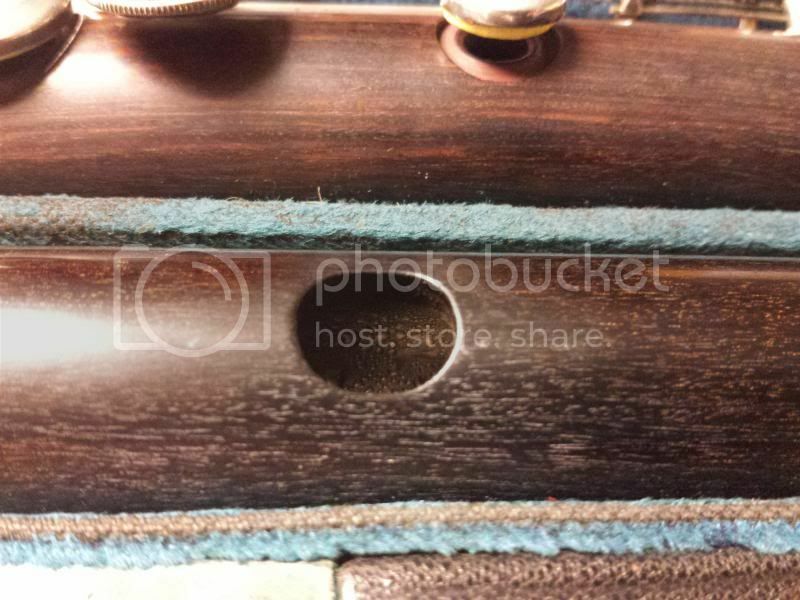 All the tone holes and embouchure hole are sharp. The stamp is dark and crisp on every joint. 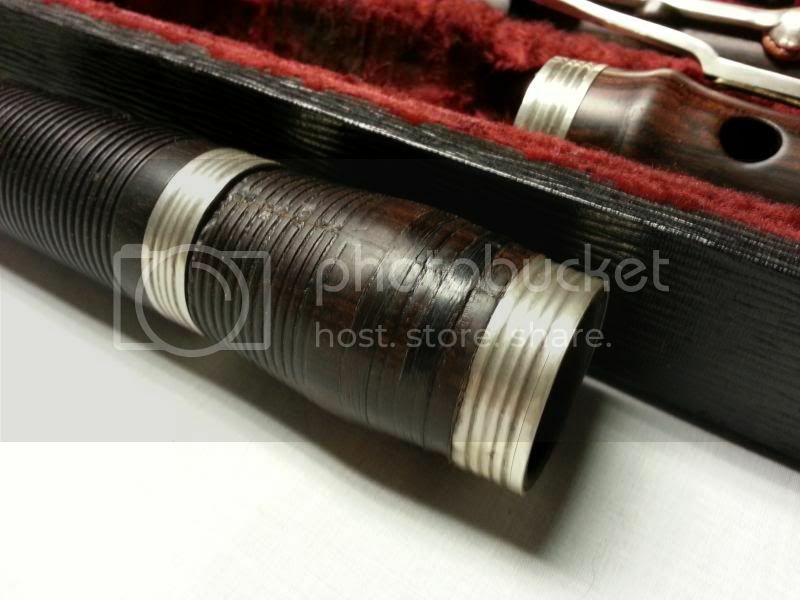 Weygandt's training as a wood turner is evident in the lovely turned rings on this flute. 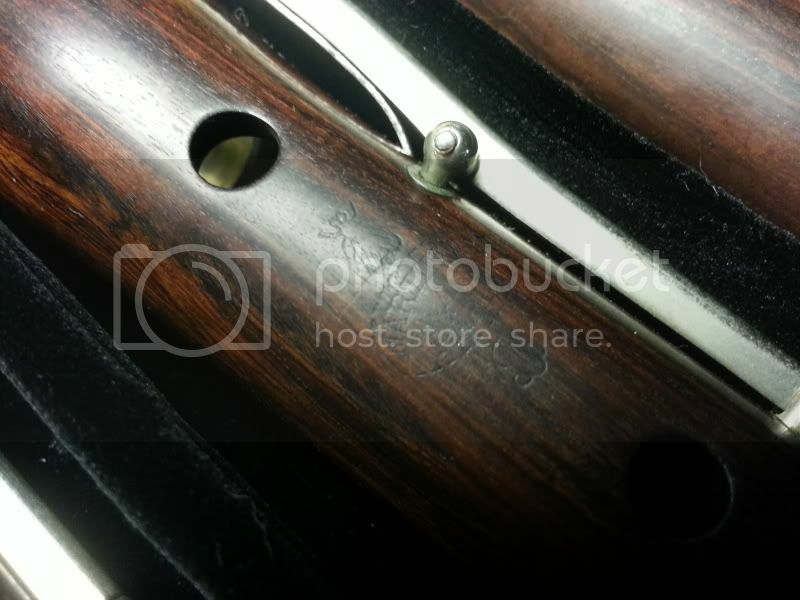 There is a small hairline crack to the barrel that has been sealed and stable for the last year. 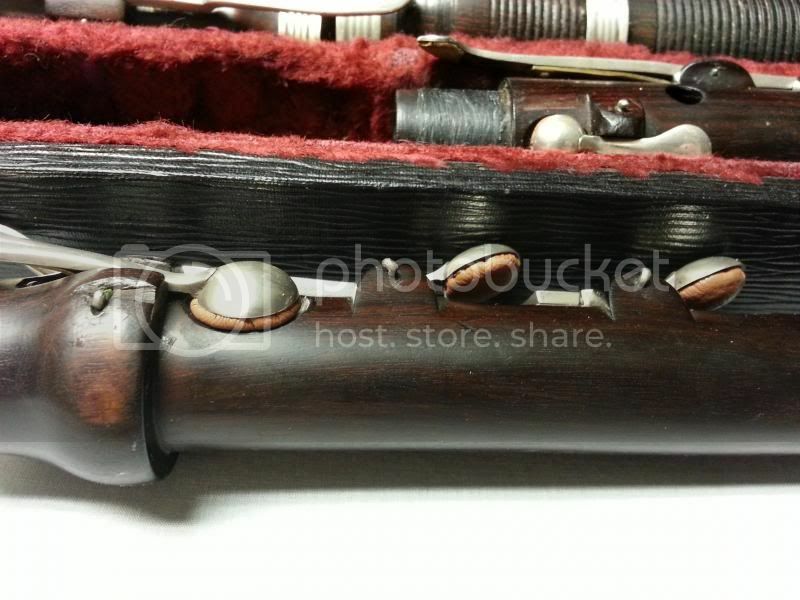 Beyond the shear value as a collector's flute, this flute is a wonderful player. It blows very strong thanks to the metal lined headjoint, but still with that lovely boxwood sound. Chromatic tunings are quite good, and baroque fingerings can be used as well as the keys (though the f-natural is characteristically high). Pitch is between 415 and 433. 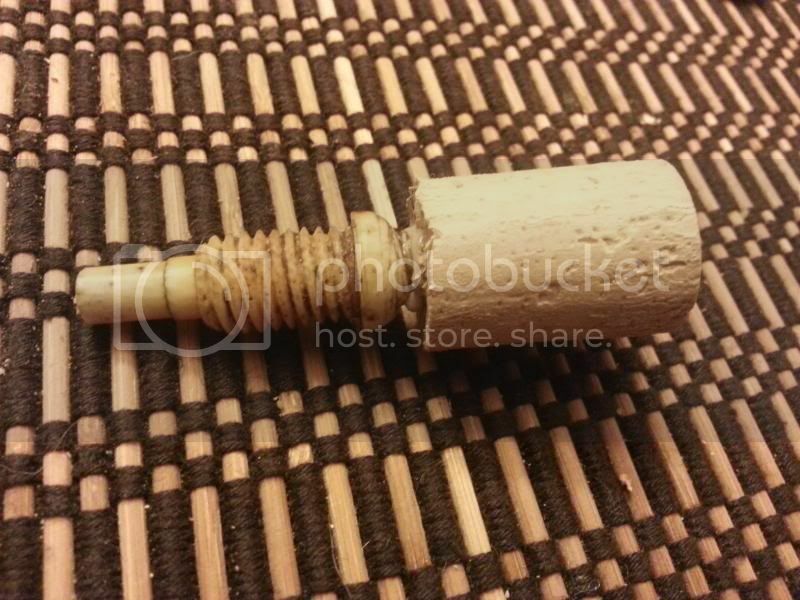 The flute has been completely overhauled with new pads, cork stops on keys, tenon threads, head cork, and liners sealed. The head cap is a lovely replacement made by Boaz Berney of Montreal and is made of reclaimed ivory and comes with a screw assembly. 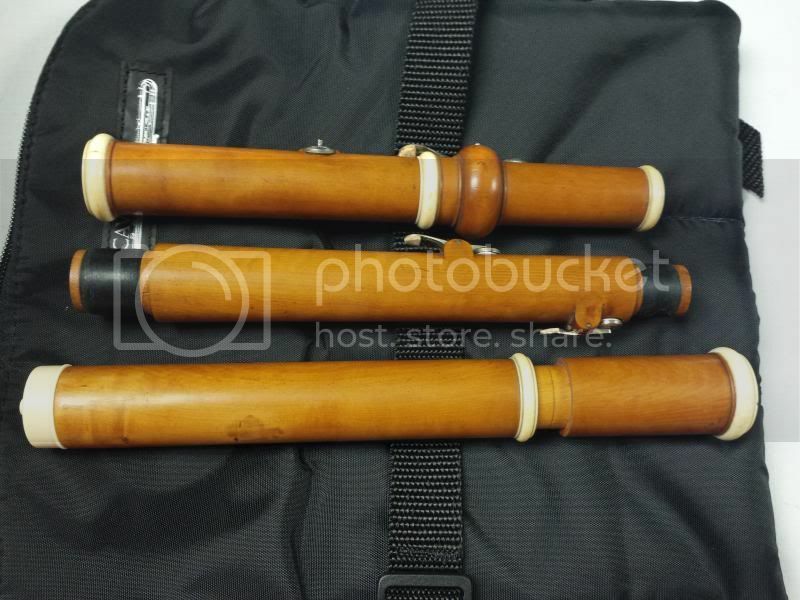 The flute will also come with a new cavallaro roll case. 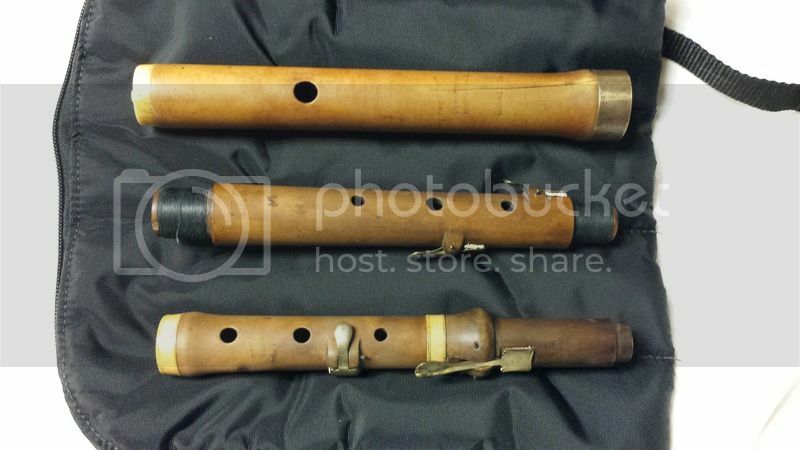 Rudall Carte & Co. Cocuswood Bohem Flute. 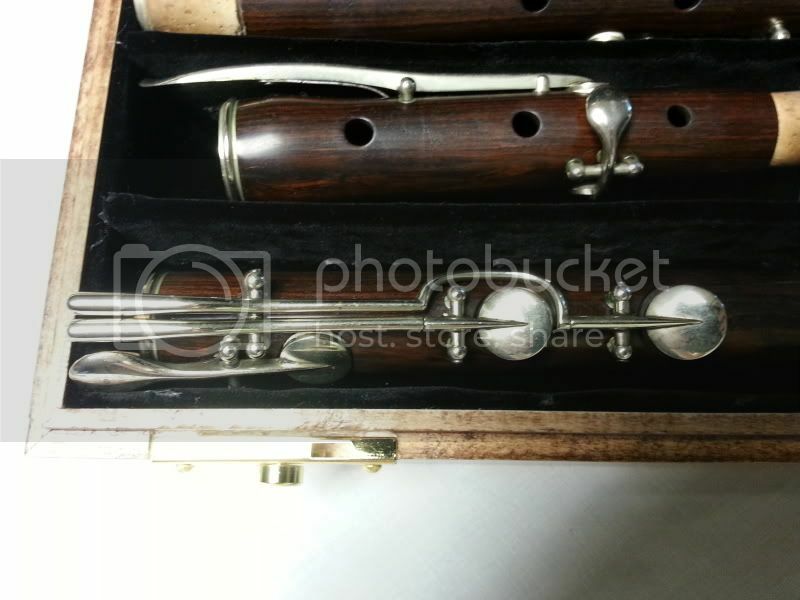 This Rudall Carte & Co. Ltd flute was made around 1912 in a beautiful cocuswood and with sterling silver keys. 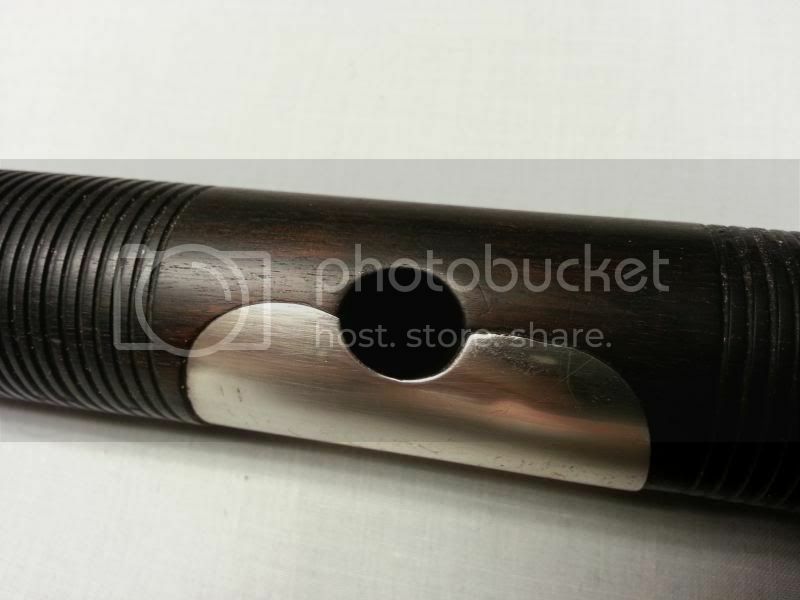 The headjoint is fully lined and is slightly thinner than I am used to seeing on wood boehm flutes. 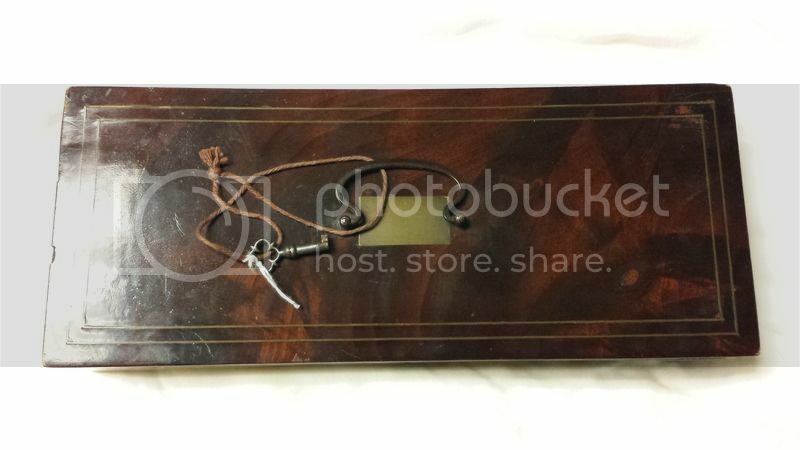 The original owner made some modifications to the keywork as you can see, most likely for ergonomic reasons. The c# touch has a 1939 liberty dime soldered on, which I have left as is, the g# key touch was extended a bit, and two keys have cross hatching to them. 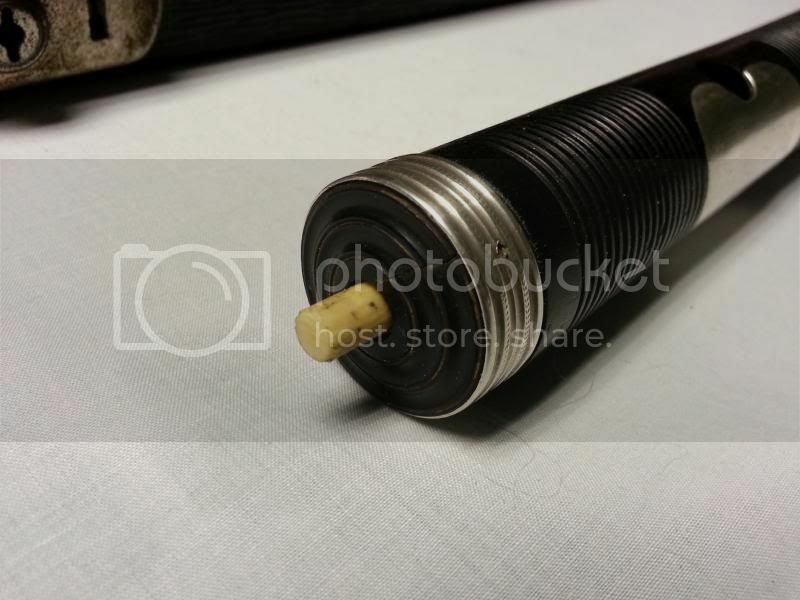 The crutch assembly was moved probably at the same time, but the original crutch has been since lost. 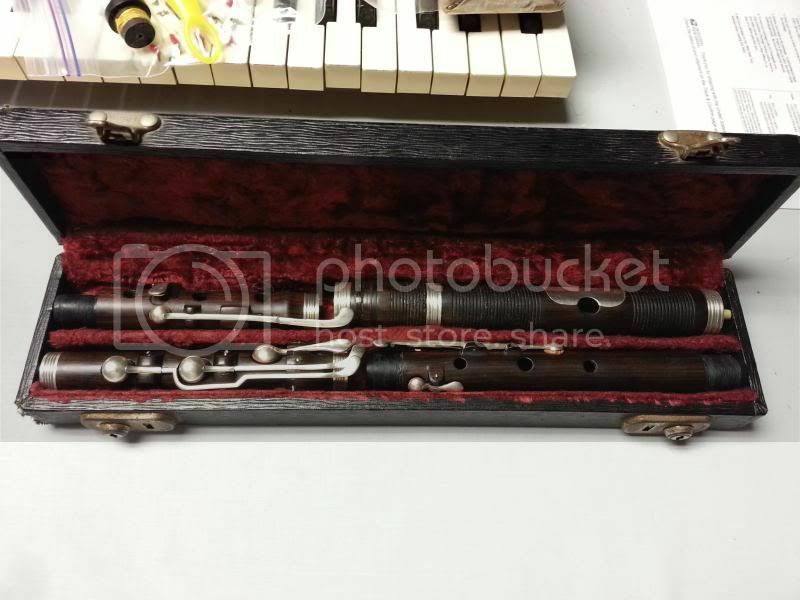 This flute has received all new pads and corks, and 2 springs were replaced. 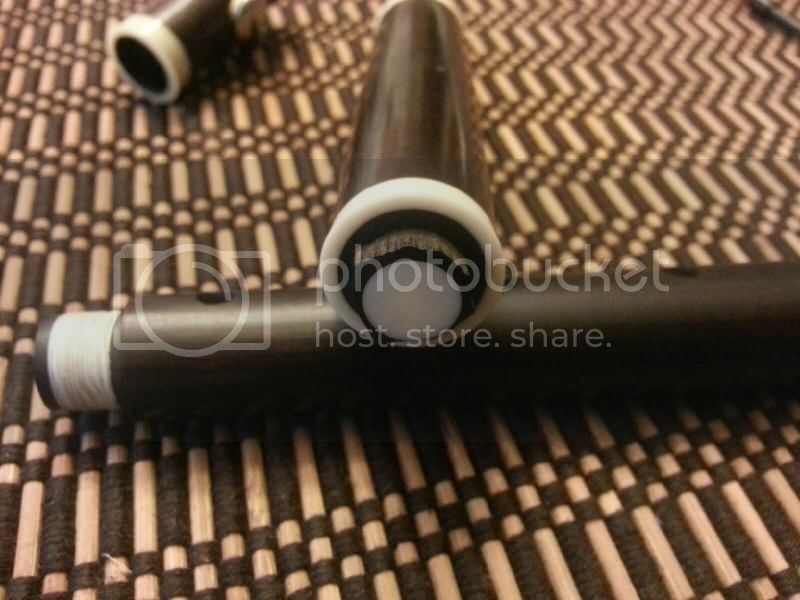 It plays with a wonderful singing sound - the 3rd and 4th octaves are simply amazing. The D4 pops out crystal clear, just like it was a G3. 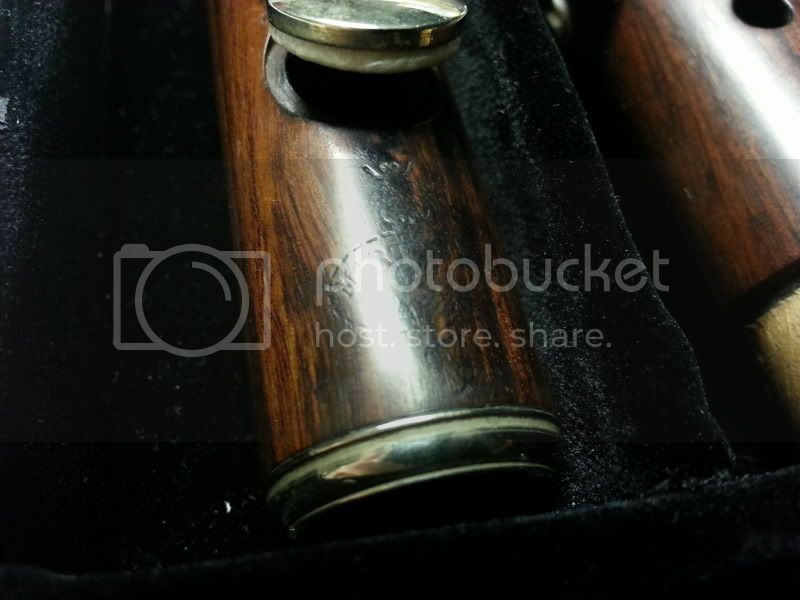 The intonation on this flute is impeccable at 440, which is amazing considering when it was made. 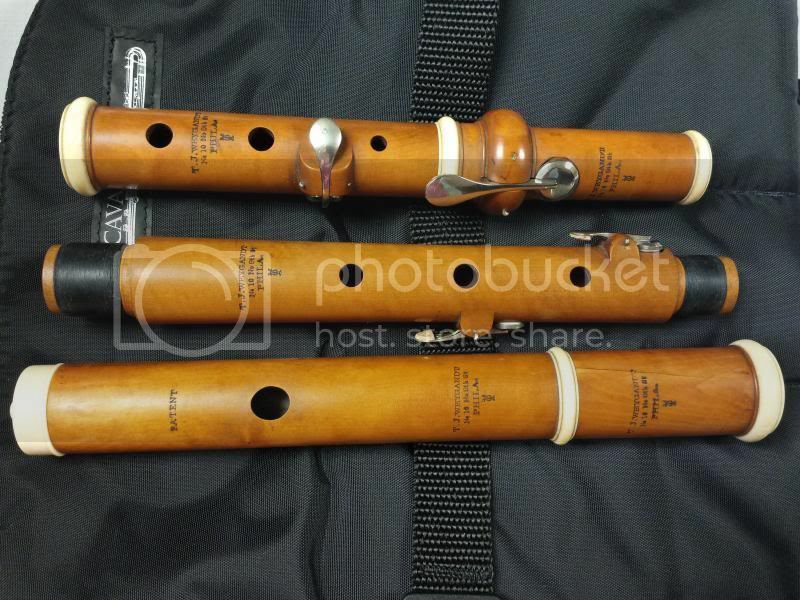 If you know Rudall Carte flutes, you know there are different levels of quality on them. The ones with the larger keys are more intermediate instruments. 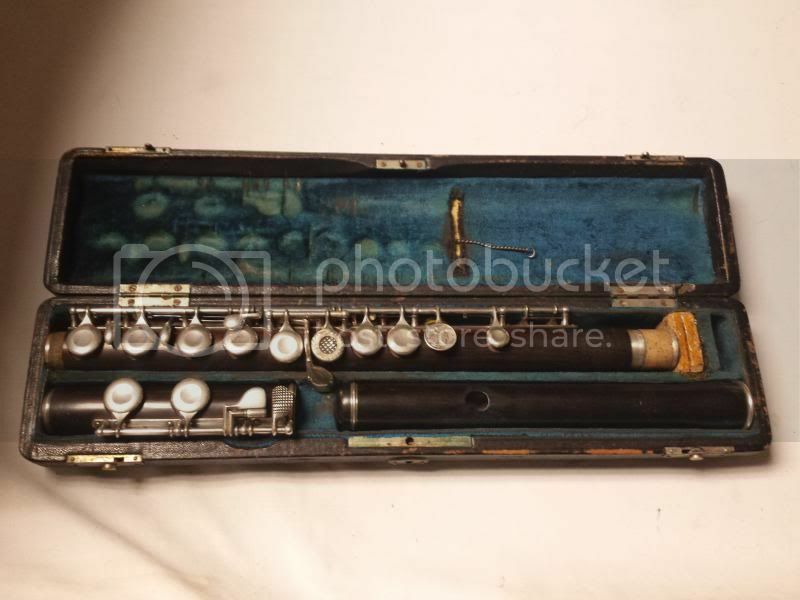 You don't see ones like this come up often - they are the professional quality ones; the flutes people hang on to. Metzler, London 6-key flute. This is an early example from the Metzler shop in London. 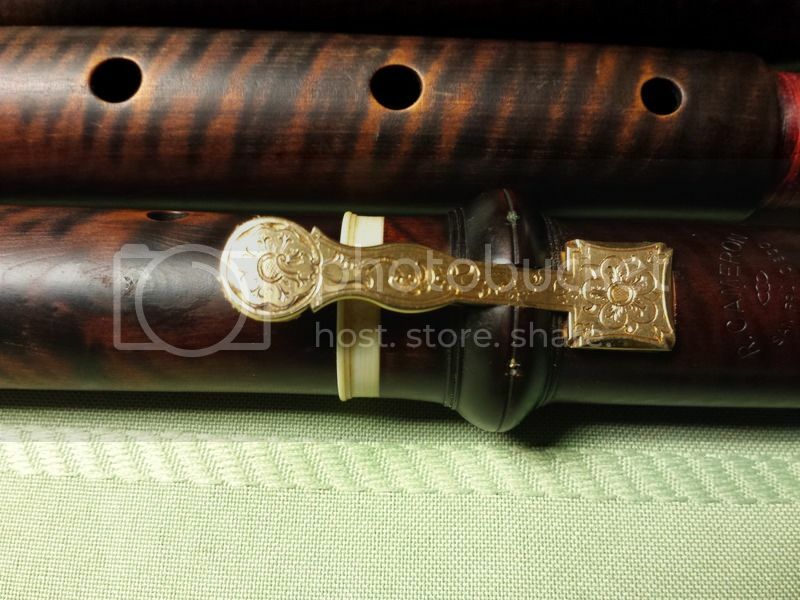 The flute is made of a beautiful grain and color cocus wood with stunningly carved rings and headcap. 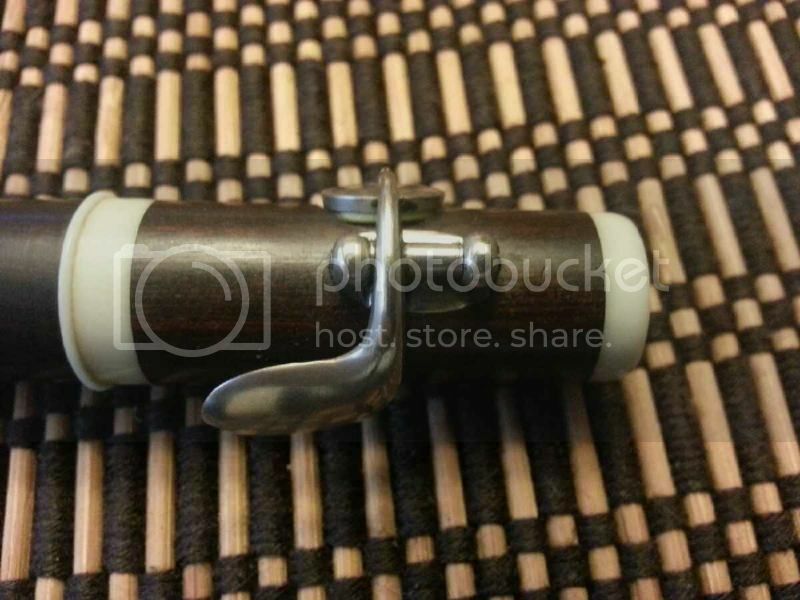 The turning on the rings of this flute is very nicely done. The 6 keys are all sterling. 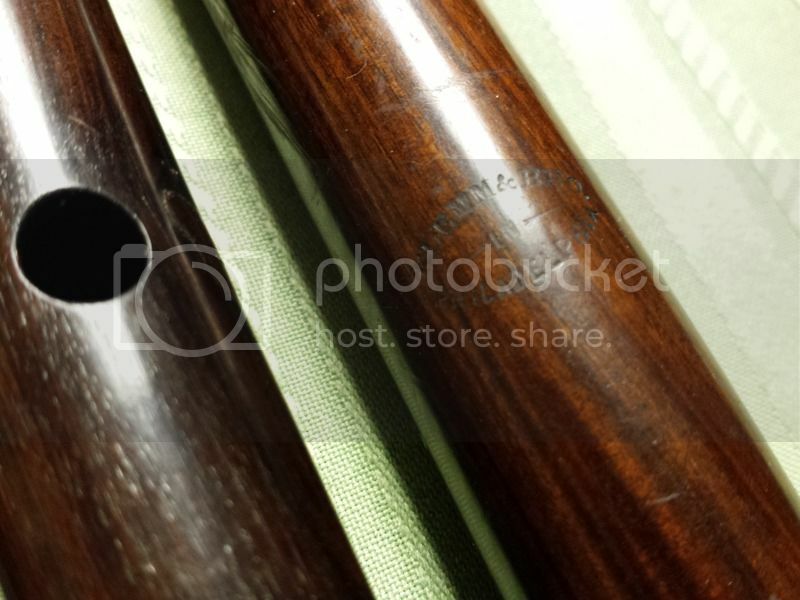 Joints are marked "Metzler London" and the barrel is marked "Metzler - London - 105 Wardour St." The address indicates a date range of 1816 - 1833 for this flute since it is not marked "Metzler & Co."
The flute has had the head cork replaced, new tenon threads, new pads, and the two cracks sealed. 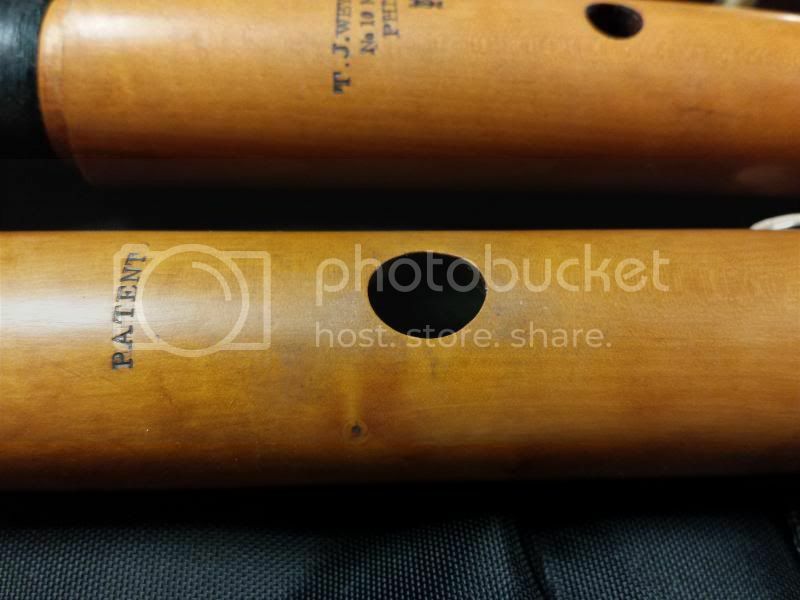 The headjoint crack was brought together so that the embouchure hole is not distorted at all nor enlarged. Please see the pictures of the repair. You would have to search for the hairline crack in the head to find it. 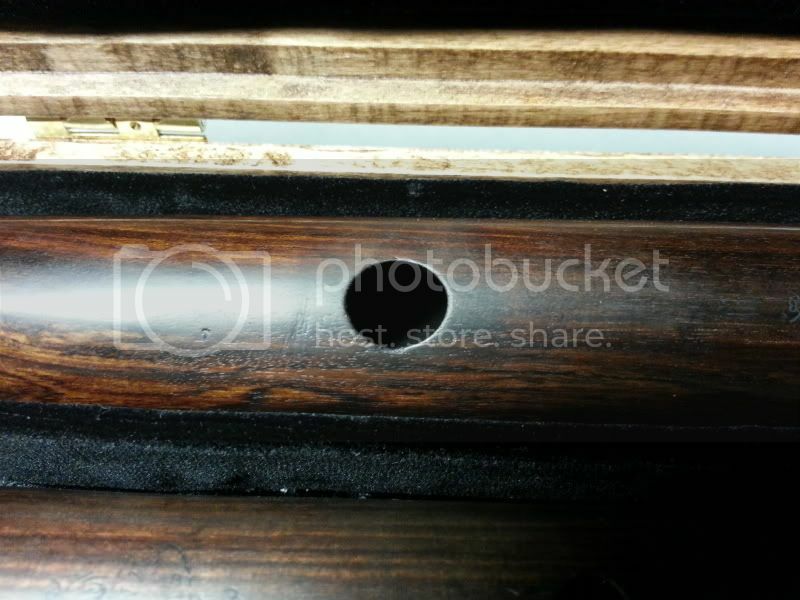 The barrel is fully sealed - liner and wood. 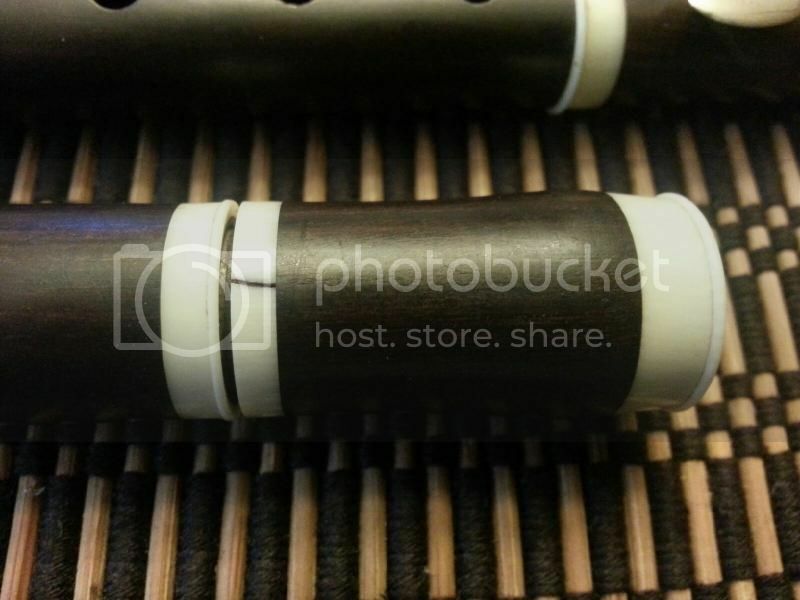 The flute plays with a lovely sweet tone that you would expect from cocus wood. 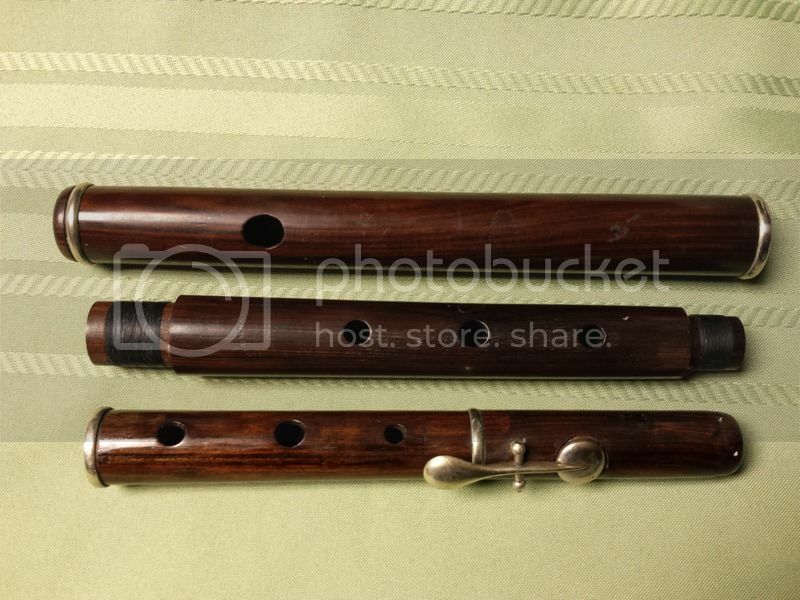 The intonation is very good for this type of flute, and it plays at 440 with the head almost all the way in. Pitch range is probably 430 - 442. 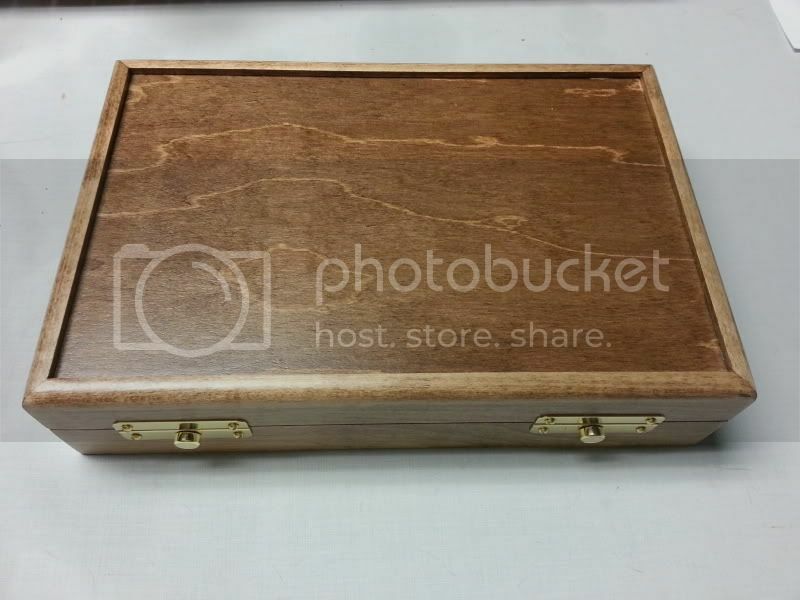 External links to more pictures: picture 1, picture 2. 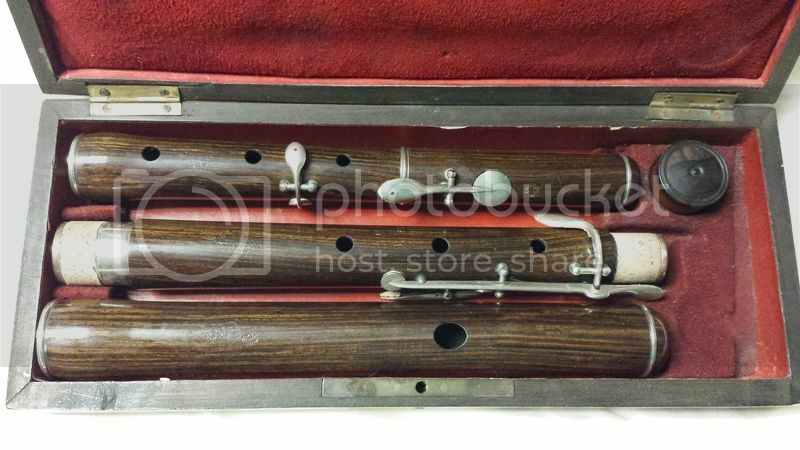 Wurlitzer 8 key flute with ivory head. 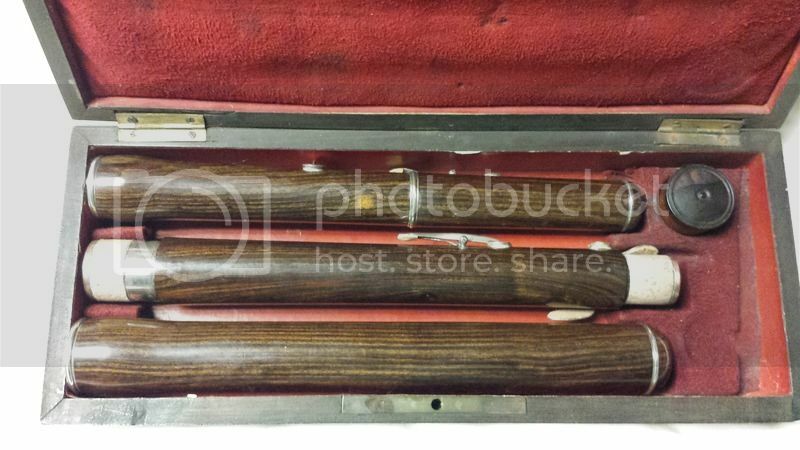 This is a rare early example of a very high quality flute from the Wurlitzer shop in Chicago. 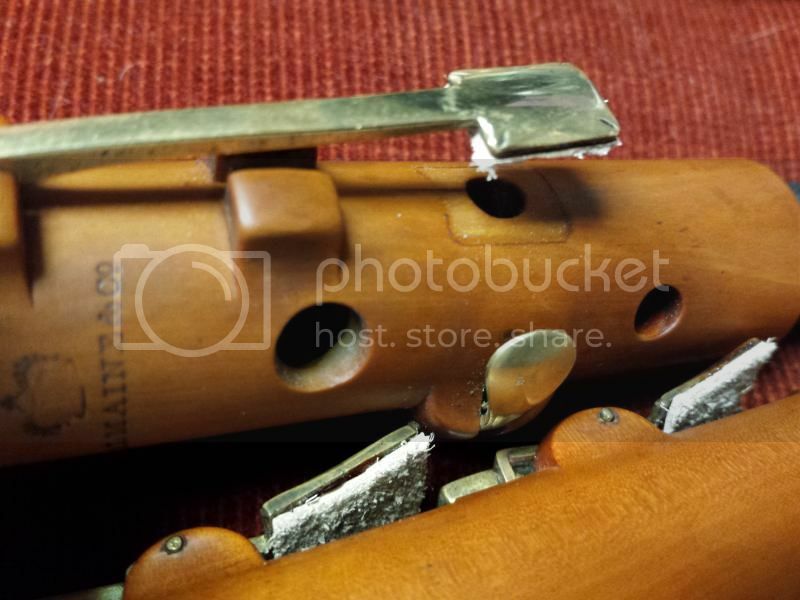 Made around the turn of the century, this flute features an ivory headjoint with the embouchure hole still intact. There is a small crack on the back side of the head which has been filled. 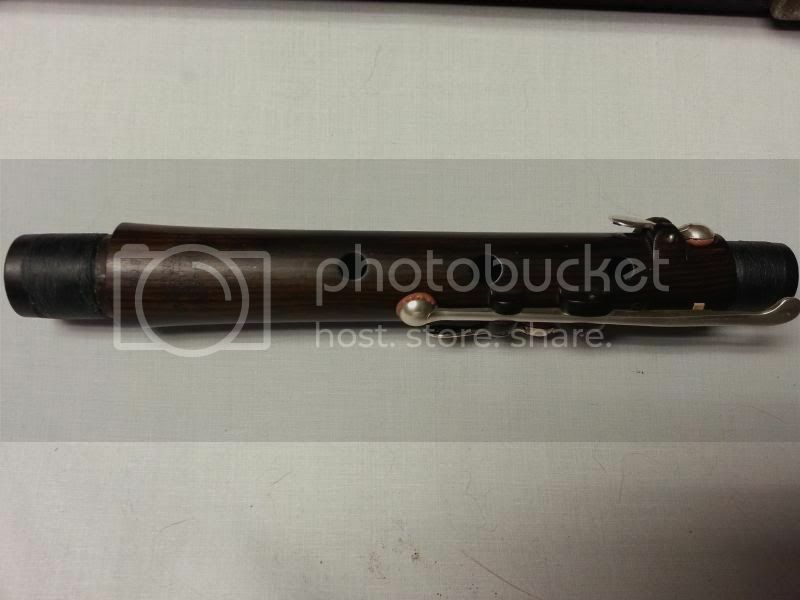 There are absolutely NO cracks in the wood of this flute anywhere and this flute was made of exceptional quality wood. 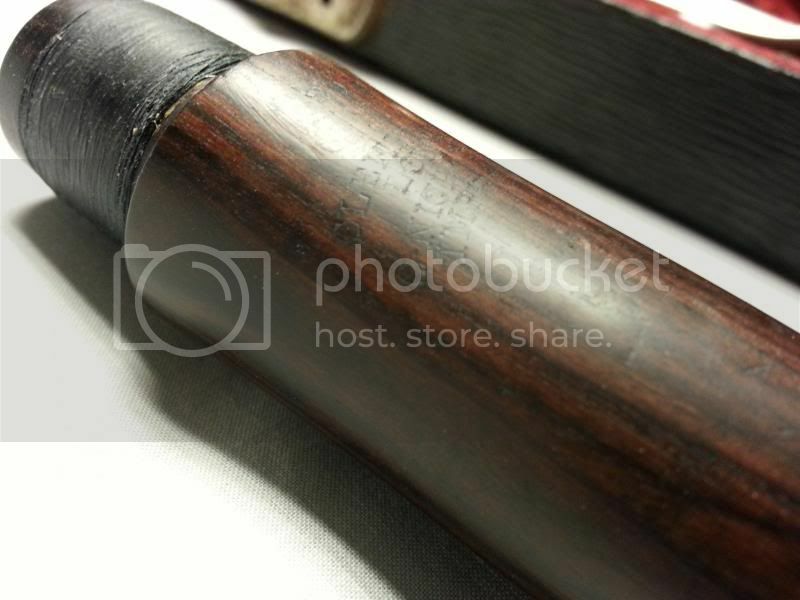 The grenadilla is a very fine, tight grain that resembles the smoothness of ebony. The left hand heart joint is made of what I believe to be cocus wood and has a stunning grain to it. 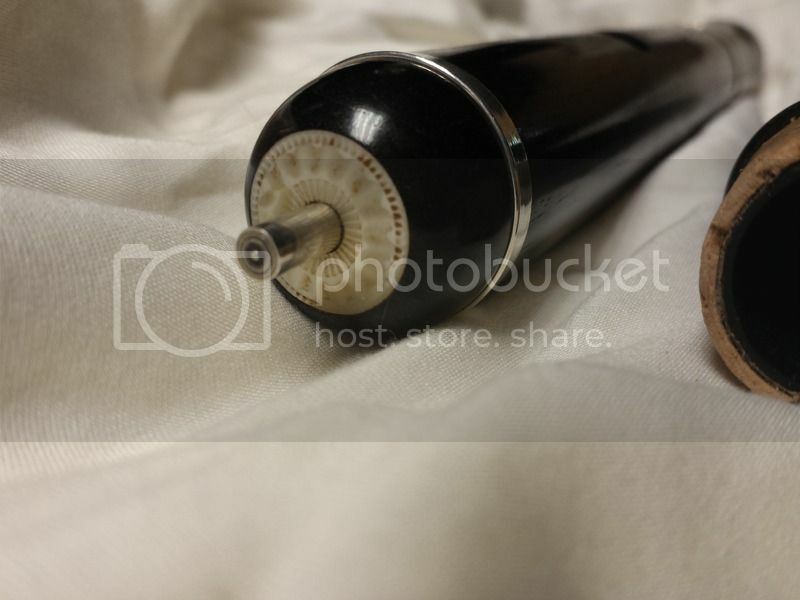 The serial numbers on the heart and the barrel match, as do the Wurlitzer stamps. 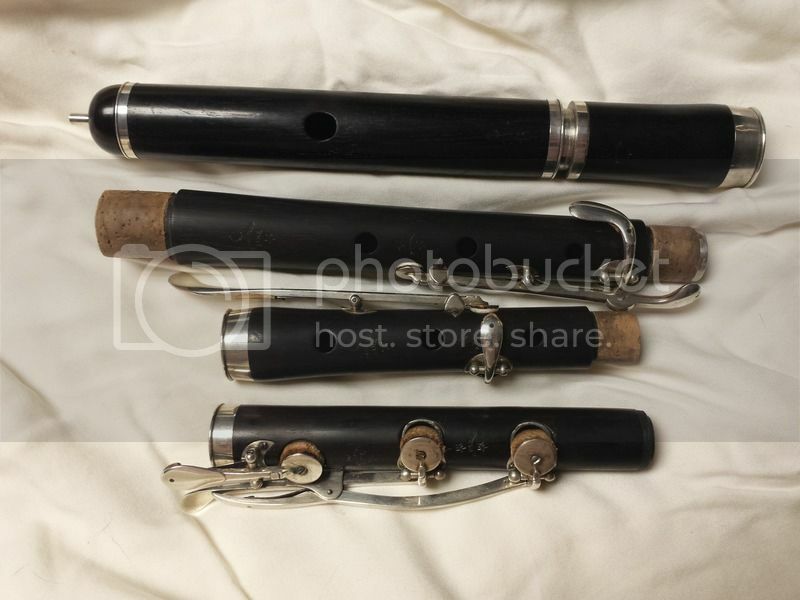 I believe this was an upgrade for this flute, possibly to darken the sound a bit. All of the keys bear the key mark of "XI" (or "IX" depending on how you look at it). The C and C-sharp touches have both XI and III marked on them. It is somewhat unusual to have key marks, and it is still unknown as to whether they denote a specific key maker, or help the right set of keys go with the right instrument. 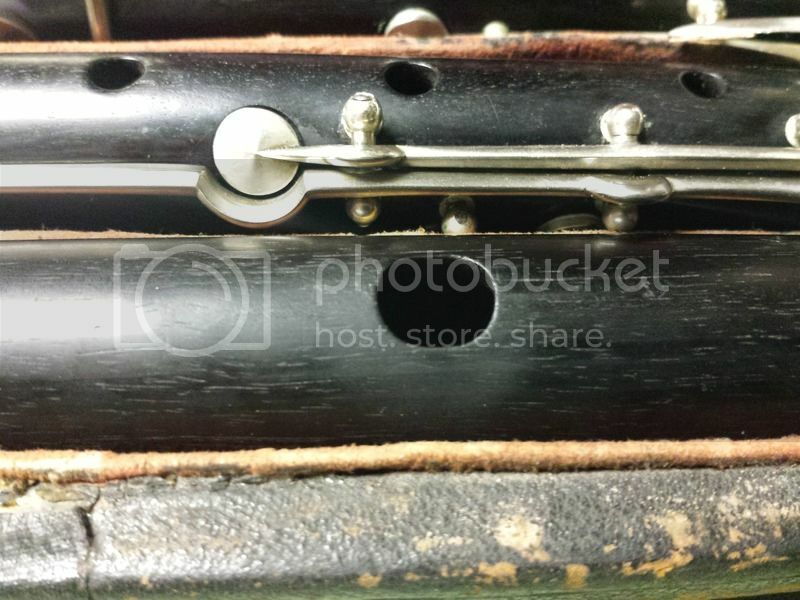 The C and C-sharp touches feature rollers and are of an elegant design I have not seen before on German made flutes, usually being found on French design flutes. 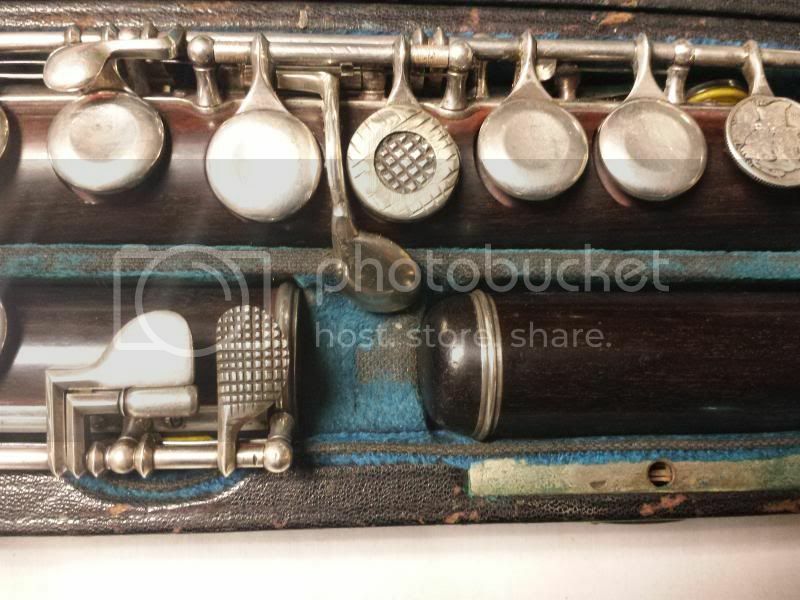 The metal rings and head cap match my G. Cloos flute, which dates from around the same period, so it is likely that they share the same manufacturer since Wurlitzer is known to import flutes and mark them with their own stamp. 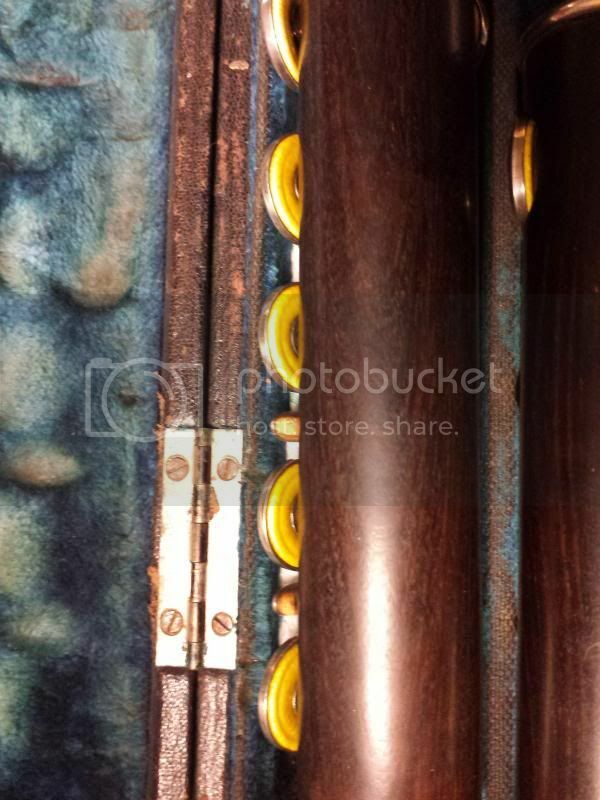 John Selboe 9 key flute in stained cocuswood. Copenhagen, Denmark maker (1807 – 1873). 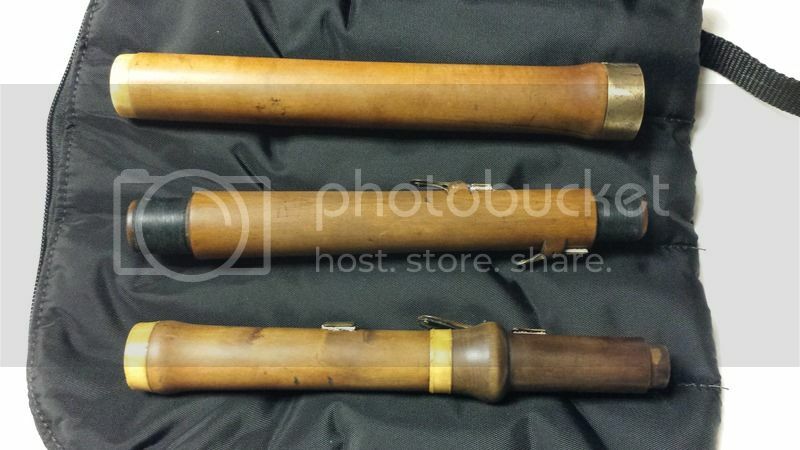 Flute dates likely from the 1840’s – 50’s. This is a fairly rare example from his shop in Denmark. Selboe was well known in his time for his flutes and oboes, and won awards for his designs. 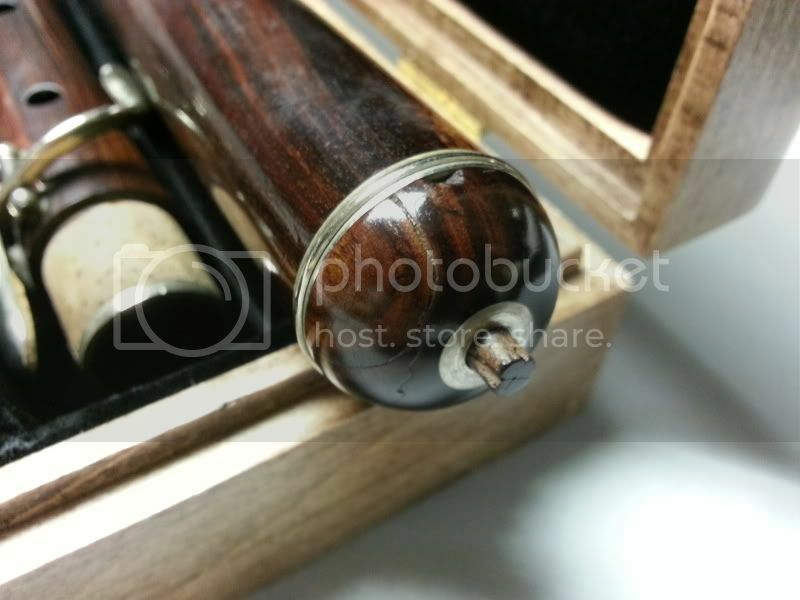 The flute is made of stained cocuswood with a shellac varnish and features high quality craftsmanship on the keywork. Keys are of solid nickel silver. 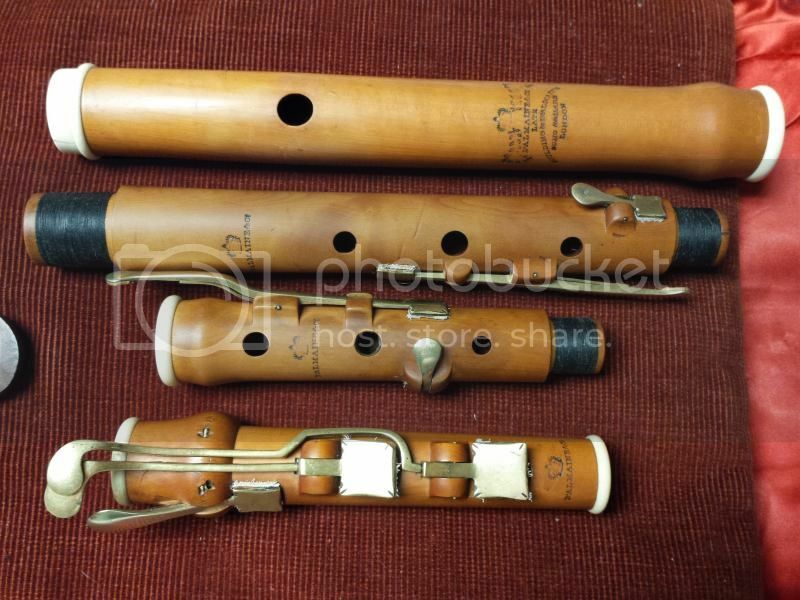 All keys except the C#, C, and B keys have brass tubes for tone holes - a design characteristic similar to many existing period Koch flutes. 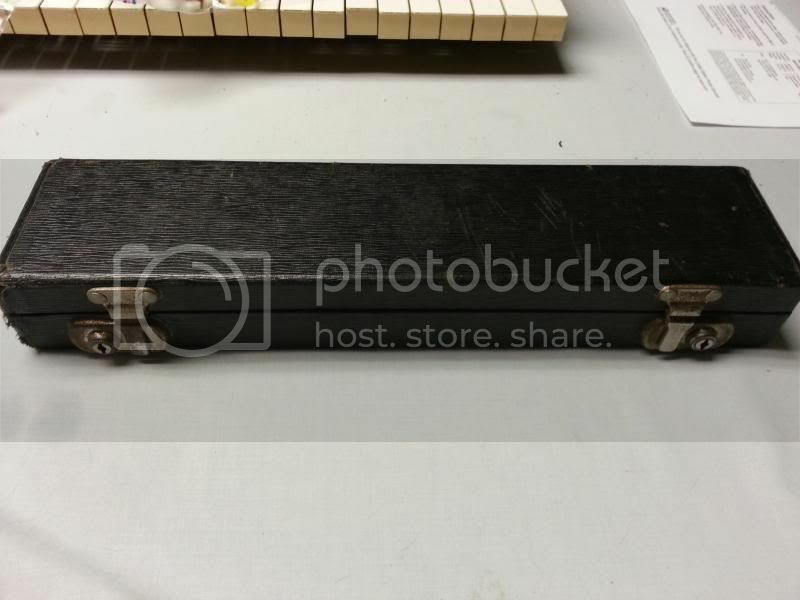 All block mounts are metal lined to ensure that the wood of the block is stable and the key tolerances do not change, and is another sign of high quality craftsmanship. There is a repaired very tight crack in the headjoint, which is no longer detectable due to re-doing the shellac finish. 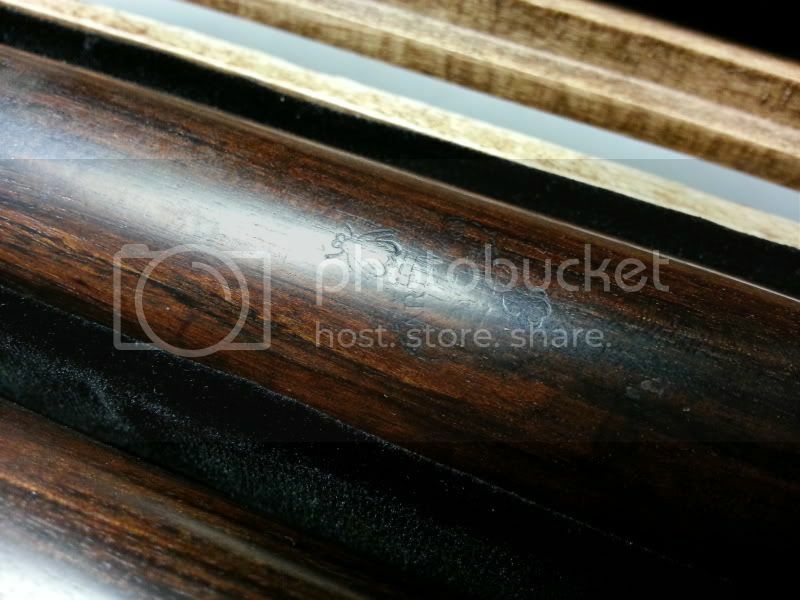 There is a repaired surface defect to the wood in the right hand joint – this wood grain anomaly was also stabilized with a threaded rod some time ago and is fully stable. Moitessier / Godfroy cocuswood piccolo. 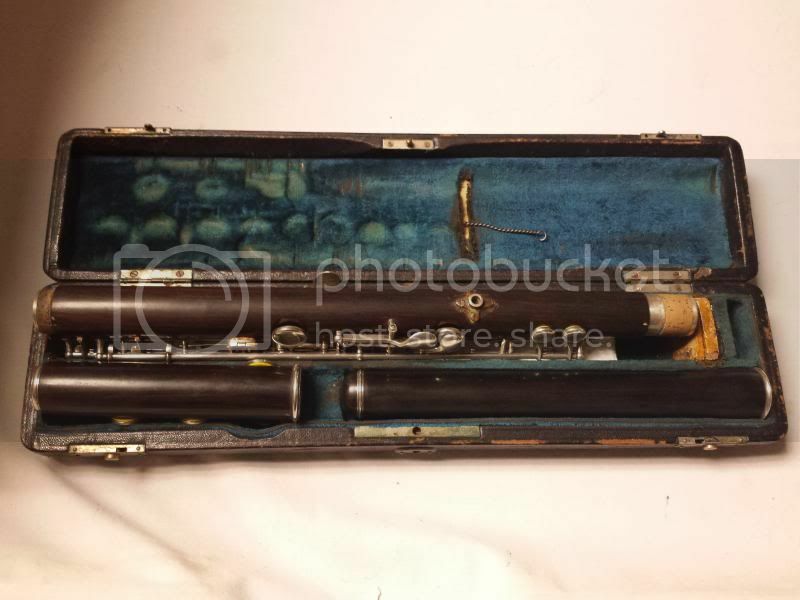 One Key Piccolo circa 1840. Marked "Moitessier A. Montpellier". 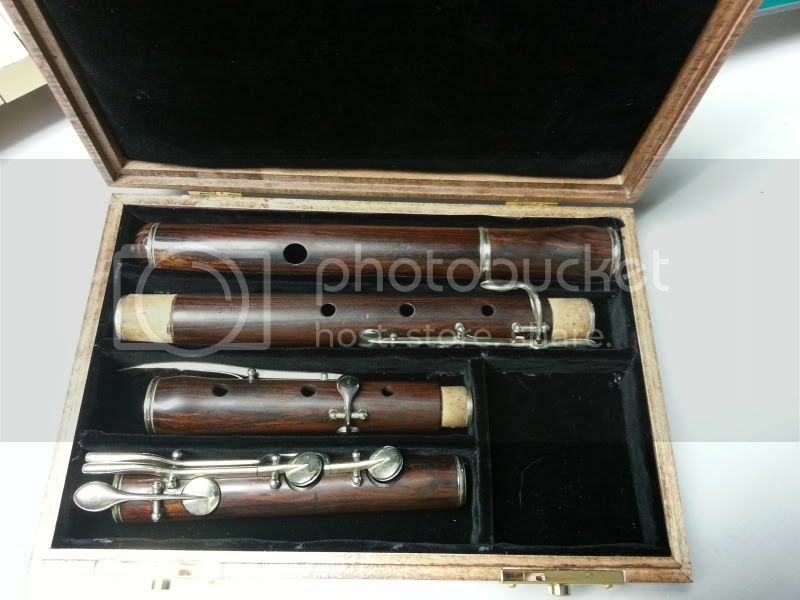 In examining the design aspects and the high quality of workmanship, this piccolo was most likely made by Godfroy Ainé for Prosper Moitessier's shop. The narrow ivory bands are all original. 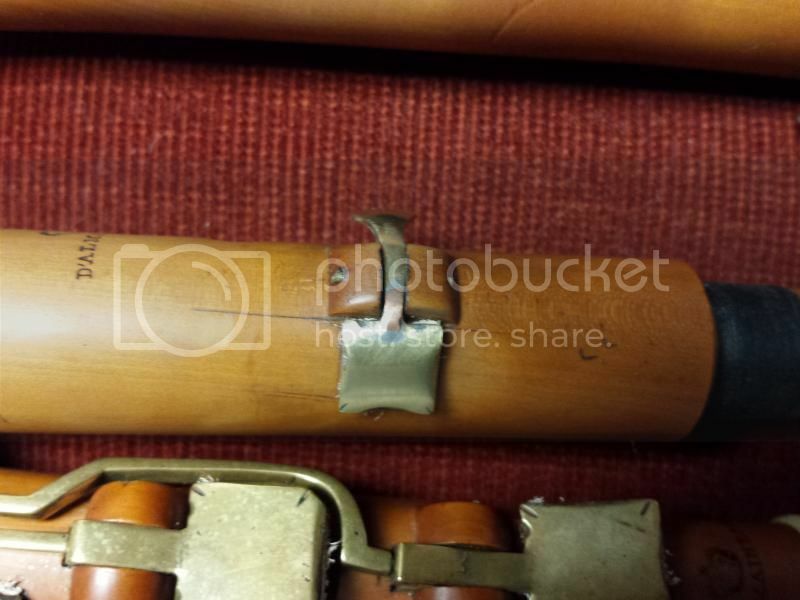 The barrel band has one small crack, but is still secure on the piccolo. 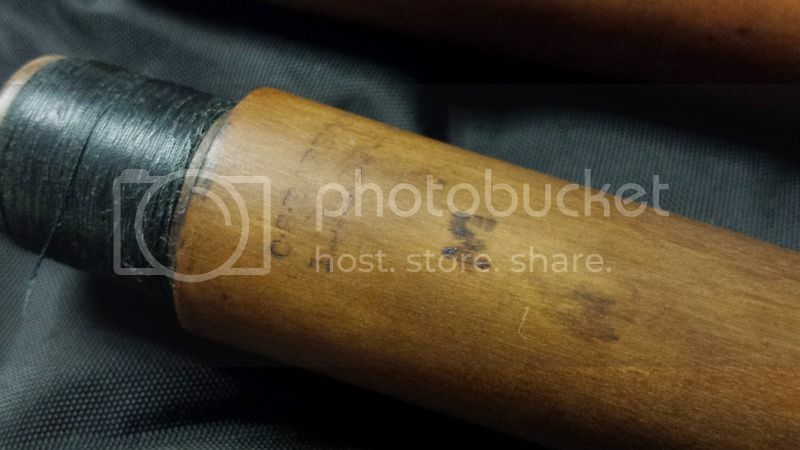 The headjoint is unlined and the embouchure hole is nice and crisp. 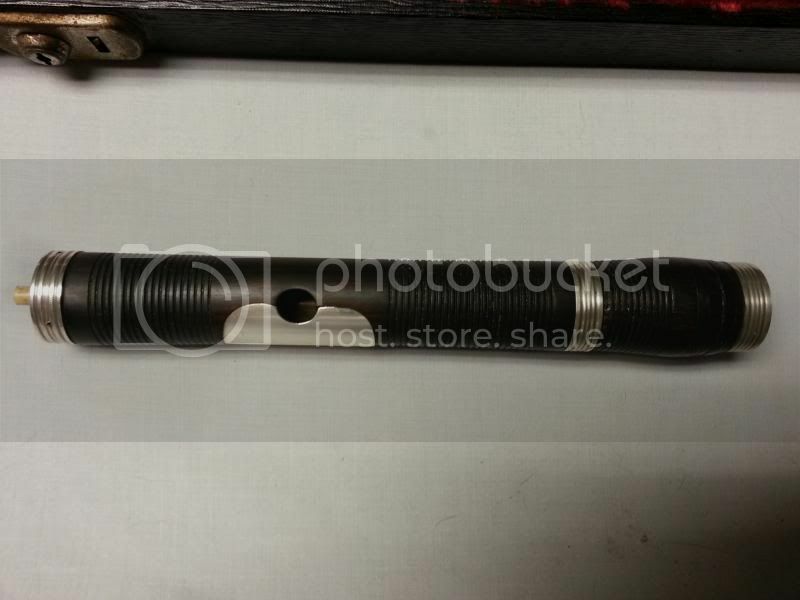 The embouchure hole measures 9.4mm x 7.8mm. The instrument has been fully restored, which included cleaning the wood, oiling, new head cork, new linen thread wrappings, and new pad on the key. The piccolo plays at A=440 and is a d-flat piccolo. (Finger a D and it blows an E-flat). It has a focused and sweet sound to it - it plays a full range, even up to a high G''' and A'''. This instrument should be played, I just don't have the venue to play something like this.